Istanbul is oft cited as the crossroads of Europe and Asia due to its unique geographic location: an ancient city straddling these two continents, as well as controlling one of the more strategic and important naval passages on earth, the Bosphorus. 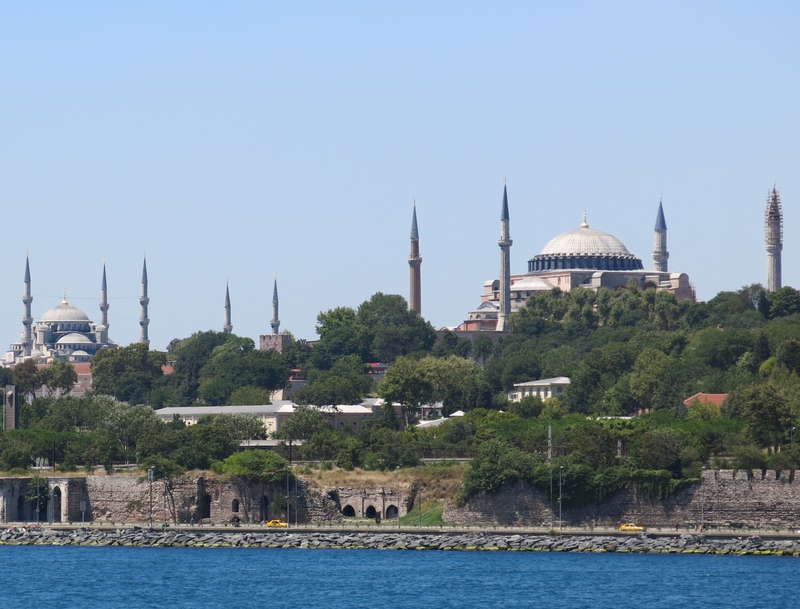 Istanbul also stands as a holy symbol for three major religions, if you view Greek Orthodoxy as a separate religion from Roman Catholicism (the Greeks certainly do!). 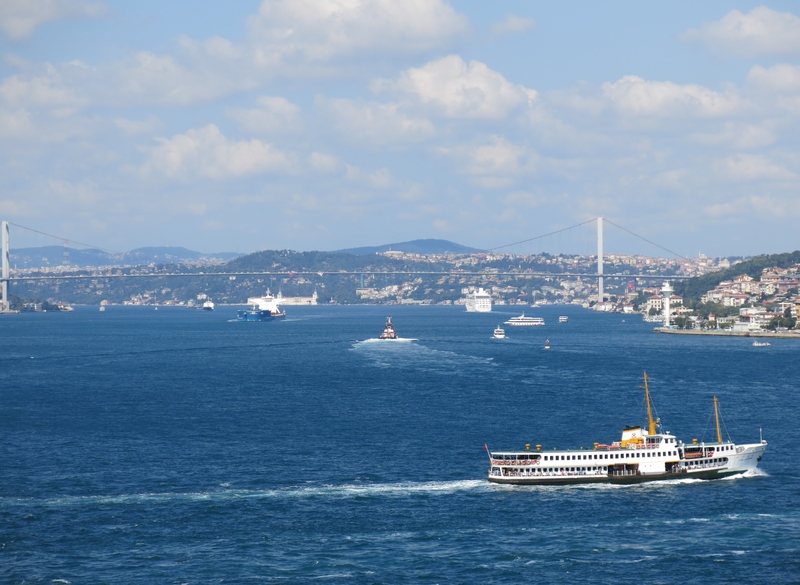 With the mighty Bosphorus cutting the narrow land bridge between Europe and Asia, the people of Byzantium-Constantinople-Istanbul have heard the tramp of armies, the whistle of arrows and blasts of ships’ cannons for centuries as nations fought for control of these straights. Persians, Greeks, forbears of the Greeks, Romans, nomadic tribes, various European nations, and, lastly the Ottomans, have all claimed this land, and all have left their indelible footprints. 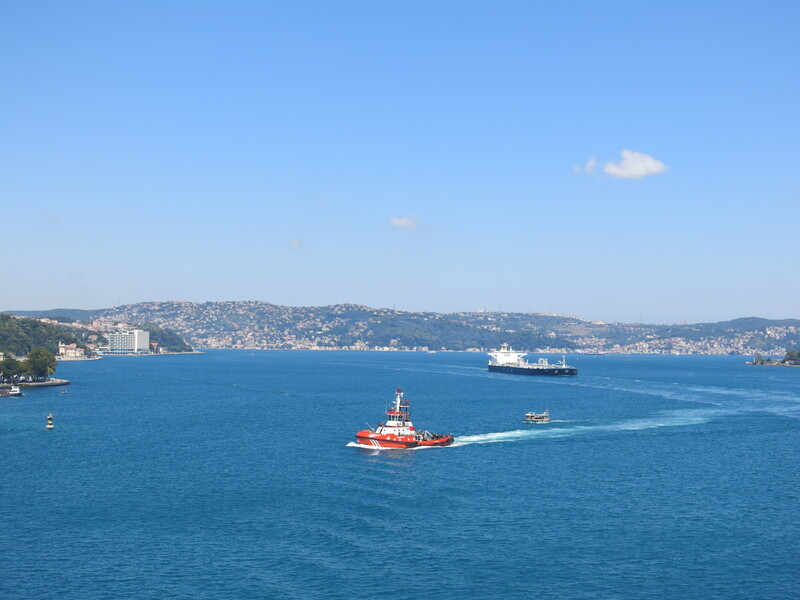 A red pilot boat leaving a tanker after a pilot steered it through the Bosphorus. At first, I found it difficult to get a sense of what Istanbul is today. With a population just under 14 million, it is impossible to even begin to know Istanbul in one week. But by the time we left Istanbul, I was already missing the city, certainly regretful that we hadn’t seen everything we’d wanted. As our ship slowly moved from its pier and headed up the Bosphorus, I knew that somehow, Istanbul had gotten its teeth into me. And no matter how much I’d struggled to like Istanbul at first, this ancient city wears a beauty and unrivaled mystique. 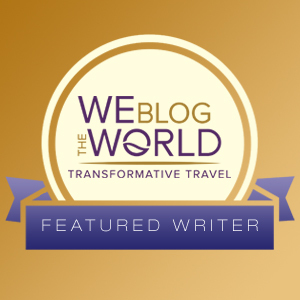 In other words, I’d fallen for Istanbul just like millions of visitors over the centuries. Istanbul is not without its frustrations. It is certainly one of the most crowded cities we’ve visited – but we expected that with 14 million people. 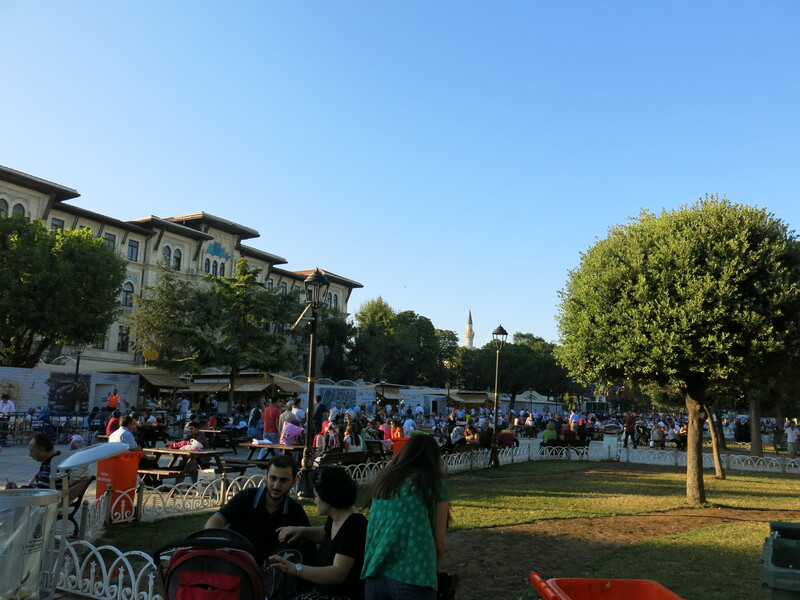 We also arrived during Ramadan, and the public areas overflowed with people as the sun went down and thousands flocked to join communal “break-fast” feasts after sunset in public parks and squares. In some areas, picnic tables were set up late each afternoon especially for the evening’s feasts. Ramadan is celebrated during the 9th month of the Islamic calendar. It is the holiest time in Islam, as Ramadan is the month in which the first verses of the Quran were revealed to Mohammad. It is the duty of every Muslim, as well as one of the five pillars of Islam, to fast from sunrise to sunset for the entire month of Ramadan, and men, especially, often attend a mosque for all five daily calls to prayer. Women may pray at home or in the mosque (if allowed – more on this later), but will also fast during the day before breaking the fast at dusk with family or friends. There are many Muslims who are lax in religious observance the rest of the year, but will steadfastly observe Ramadan with fasting and prayer. In that regard, it’s much like the majority of American Jews who are absent from temple most of the year but annually attend the High Holy Days. One of the smart things we did was hire a guide and driver to take us through some of the major historic sites in Istanbul. It was definitely money well-spent. Our guide, Emre, was extremely knowledgeable, and would spend as much time as we wanted in each attraction. 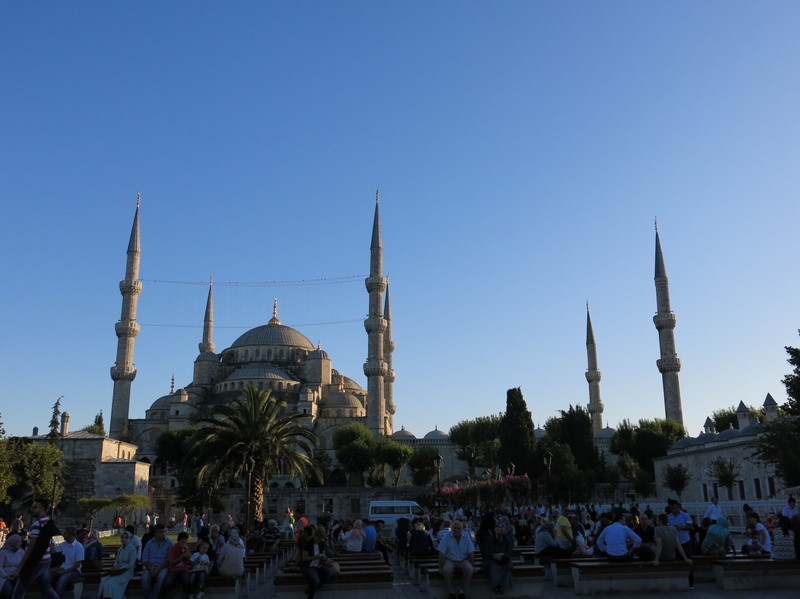 What follows is a recap of our first full day in Istanbul. 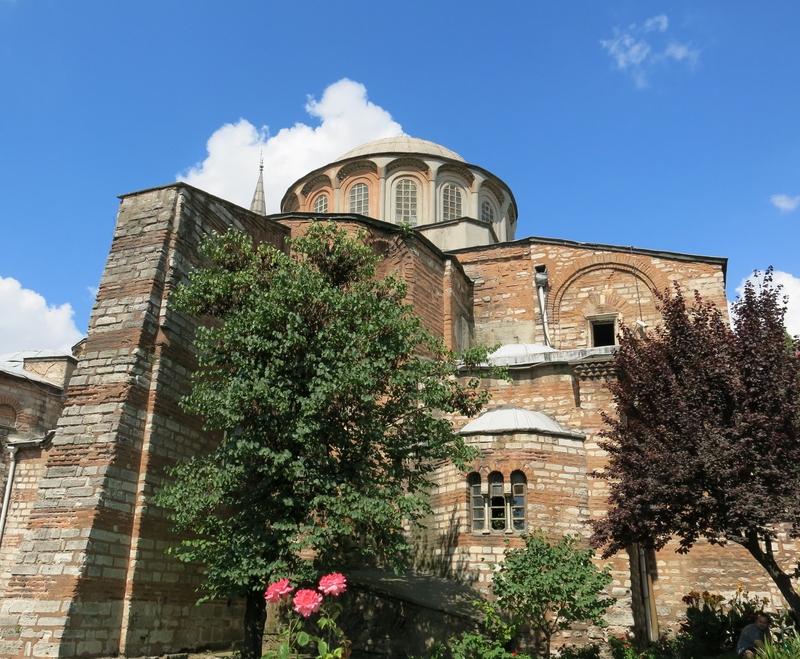 The ancient Byzantine Chora Church in Istanbul, however, set me reeling. How these incredibly beautiful mosaics and frescoes survived over the centuries was amazing. Islam, like Judaism, does not permit graven images of people or animals in their places of worship. 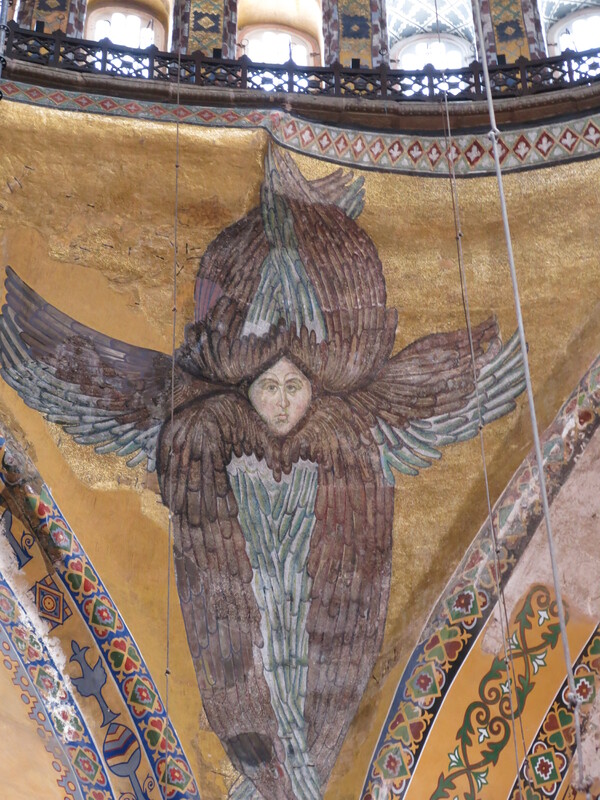 With most, if not all, churches converted to mosques after Constantinople fell to the Ottomans in 1453 (and became Istanbul), their artwork was defaced, plastered over, or permanently removed. The mosaics and frescoes in Chora Church were plastered, but thankfully many were salvaged and restored through cooperative efforts of Turkish and American curators and artisans in mid-20th c. The church-mosque was reopened as a secular museum for all to enjoy in 1958. As can be expected, the stone mosaics were more easily restored than the painted frescoes, but some of the latter have withstood the centuries. 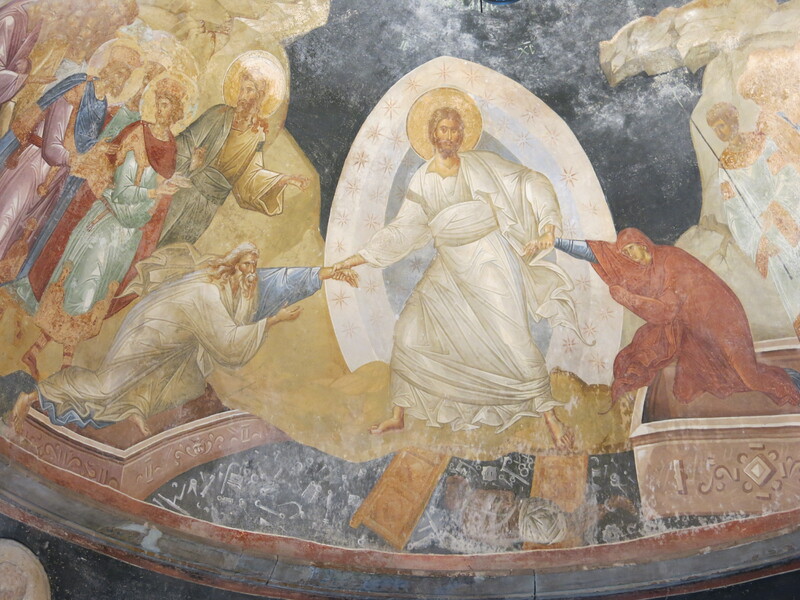 One of the more intact frescoes of Chora. 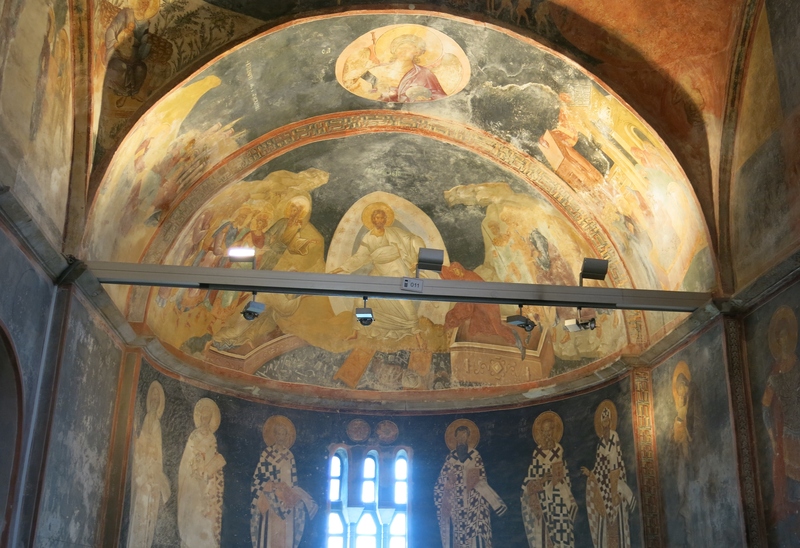 Most of the church-museum building as seen today was built in 1077-81, but the interior decorations of magnificent frescoes and mosaics (by anonymous artists) were added about 1315-21. Parts of the building are thought to date to the first church, built in the 5th c. After the church was converted to a mosque, a minaret was added as well. 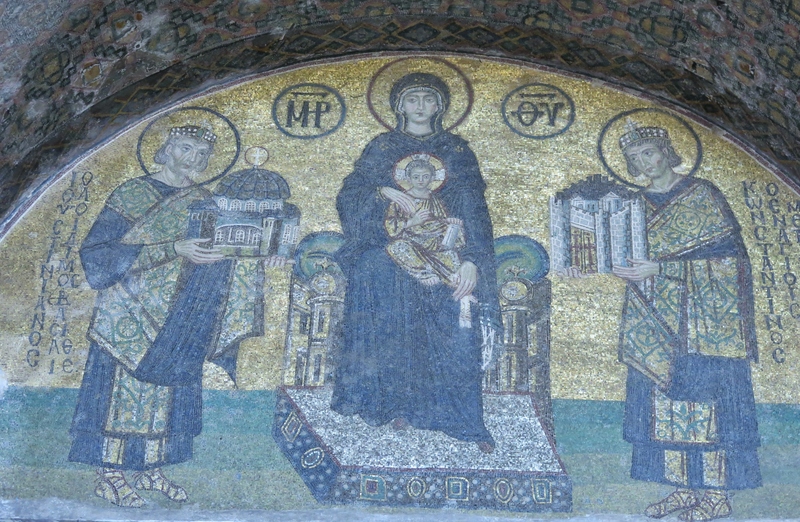 The majority of mosaics on the walls of the narthex of the church depict the life of Mary, the mother of Jesus, from her own birth, the birth of Christ, her eventual death and ascension to heaven. 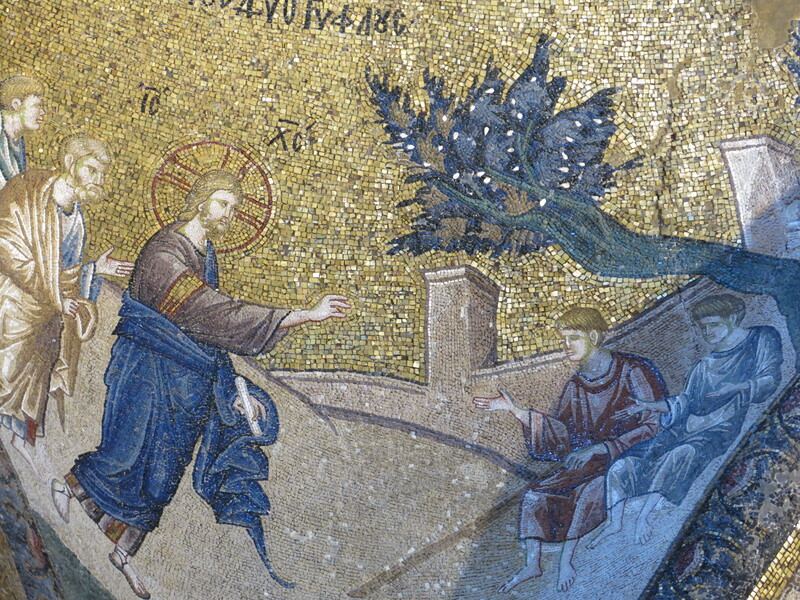 Other mosaics show scenes from the life of Jesus, including some of the miracles. Our guide told us that with the exception of the gold tiles, all the stone tiles used in the mosaics are the natural color of the stones, a fact I found amazing; I’d never imagined that stones could be so colorful. Unfortunately many of the frescoes, particularly those in the outer narthex area, were badly damaged either by intent or from the centuries of being plastered over. 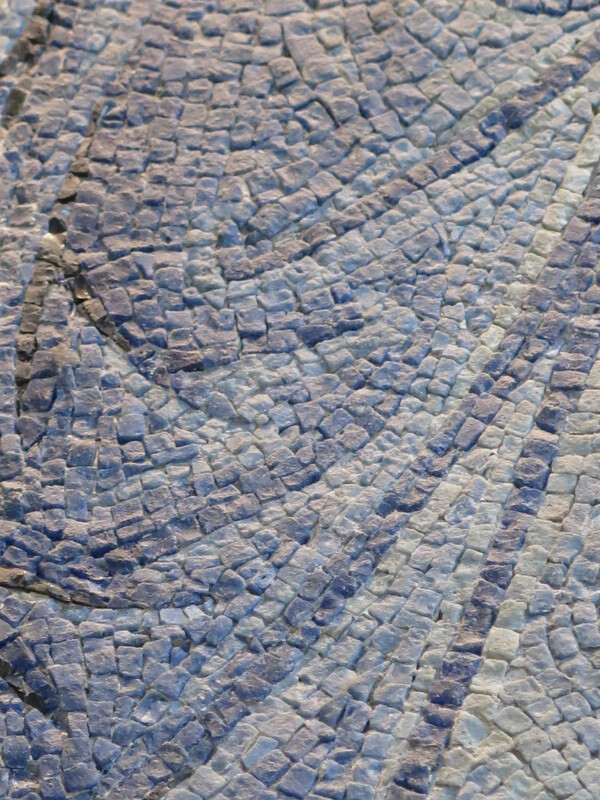 Detail of Chora Church mosaic. All the tiles used are their original (stone) colors, except for the gold ones which are gilded tiles. 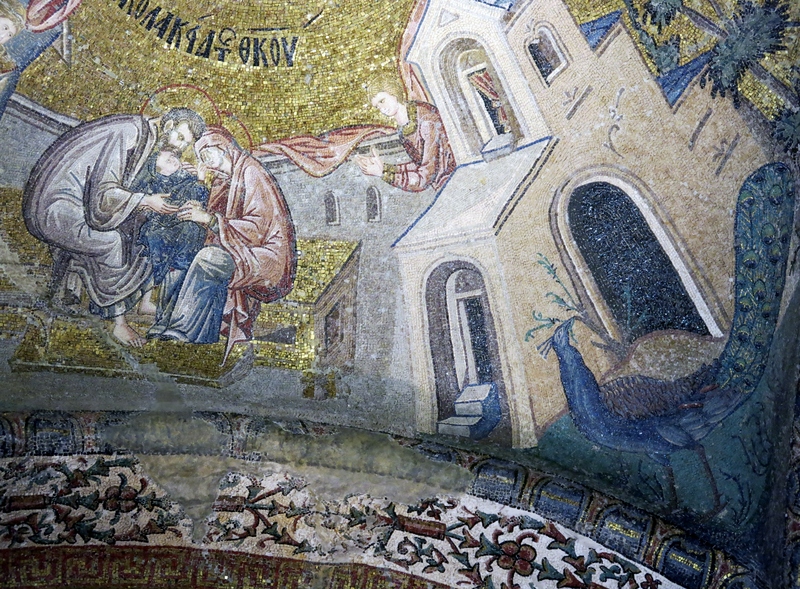 If Chora Church’s brilliant mosaics had me reeling, Suleiman’s Mosque left me near speechless. Fascinated by the grandeur of the mosque, Michael and I sat with Emre on the Prayer Hall carpet for nearly an hour, trying to absorb all the details and beauty of the interior. The creation of the great architect, Sinan, the mosque, built between 1550 and 1557, is considered the masterpiece of all of Sinan’s creations. 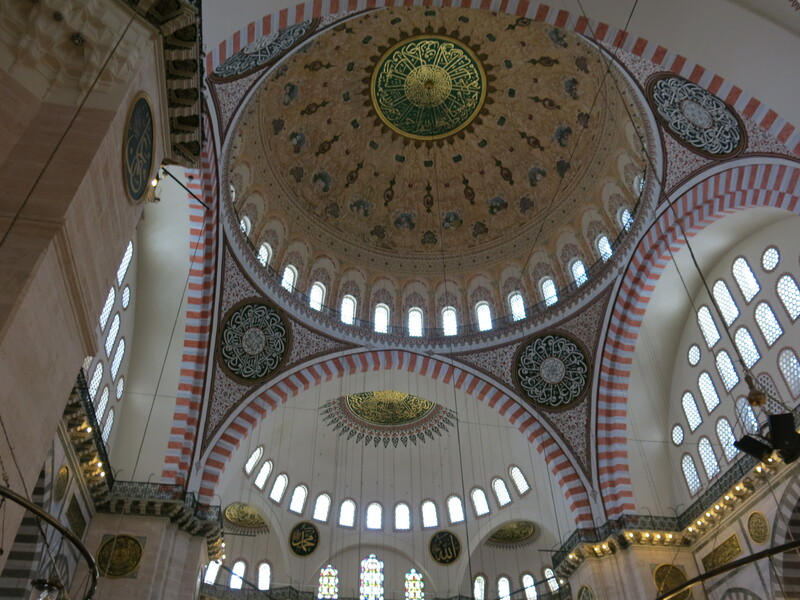 The dome is the largest of any Ottoman mosque, and the interior was designed to have a complex ventilation system and is acoustically near perfect. 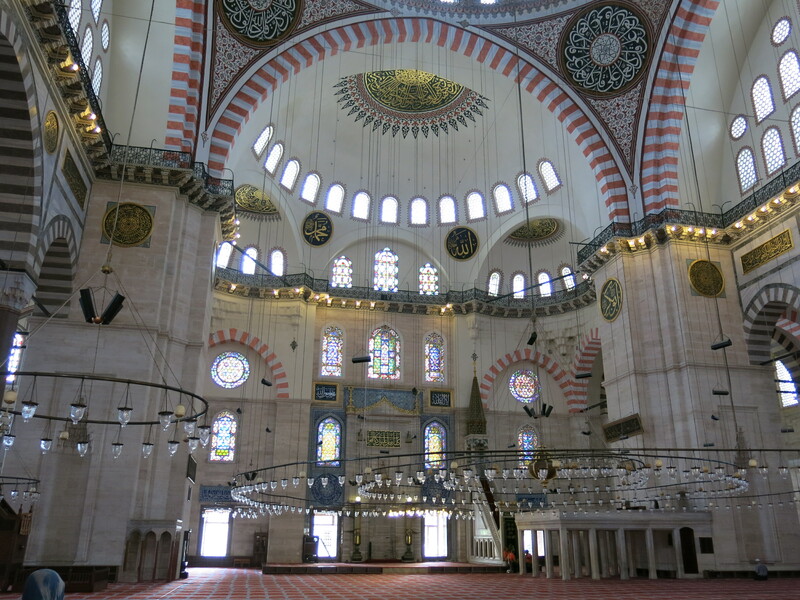 A short aside on Sinan: although renowned as an Ottoman architect, Sinan was born neither Turkish or Muslim. His exact ethnic background is not clear, but a contemporary biographer stated Sinan was born of either Greek or Armenian parents near Kayseria in Anatolia (now part of Turkey), which would mean he was Christian at birth. This is supported by the fact that Sinan was recruited and trained as a Janissary (Royal Guard), and the Janissaries were predominantly Christian youths taken from their homes, converted to Islam, and trained for this elite corps. Sinan gained notice with his engineering skills, which eventually lead him to architecture. More than 300 major structures are attributed to him during his long life, as well as dozens of smaller facilities. Dome and supporting half-domes with banks of windows for lights and ventilation. 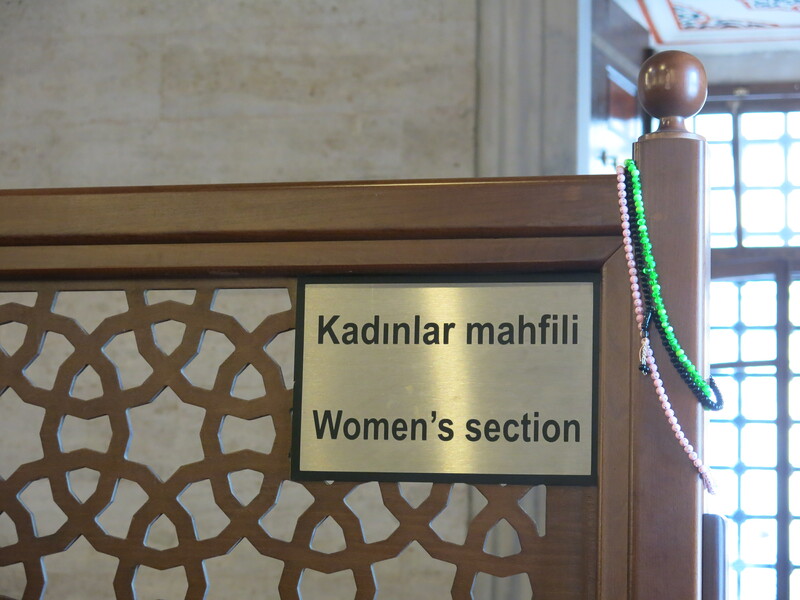 Women’s screened off section in the prayer hall. The original chandeliers contained ostrich egg oil lamps. One feature of the mosque we found intriguing. While the interior’s illumination was largely from natural light through the many windows, additional light came from oil lamps contained in halves of ostrich eggs. 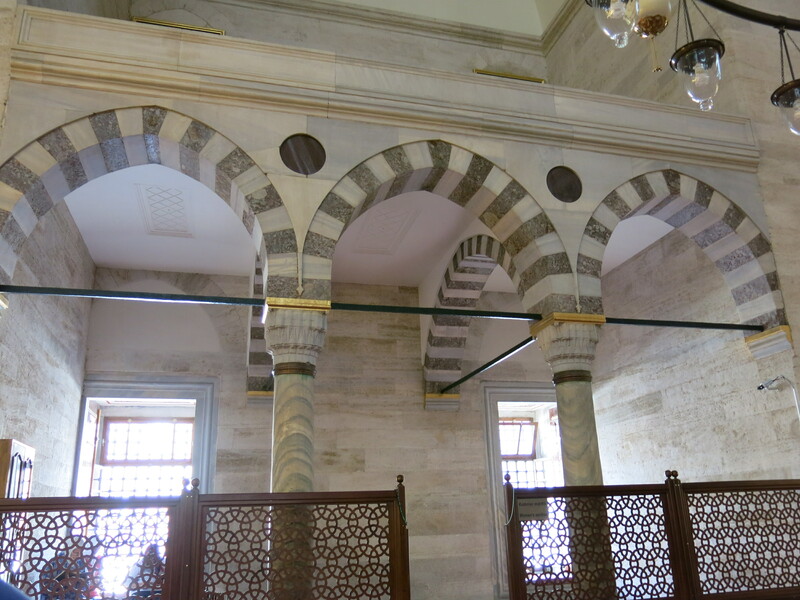 Sinan also devised a clever way to draw the soot from the burning oil and thus prevent it from dusting the mosque’s interior. As part of the air venting system he built two slits high in one wall, which led to two small rooms where the smoke and soot from the burning oil could be drawn and collected. Periodically, the soot would be gathered and ink would be made from the soot residue. This ink would then be used only for copying Quran scriptures, or other holy uses. The Mihrab, showing the direction of Mecca. Muslims pray 5 times a day, always facing towards Mecca. The two small slits above are to draw in soot from oil lamps. Another feature we learned concerns the number of minarets. 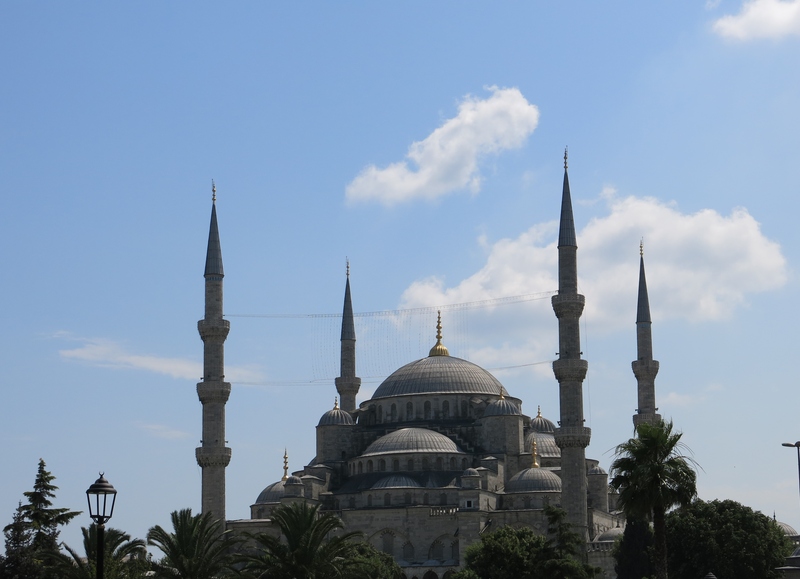 Only an Ottoman sultan could have more than two minarets attached to the mosque. 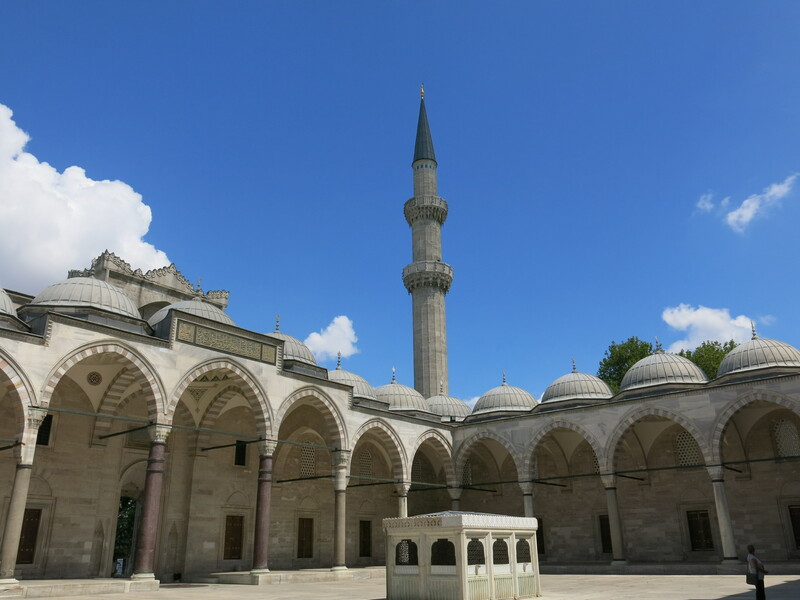 Sinan designed Suleiman’s mosque to have four minarets, which was the usual number prescribed for a sultan. 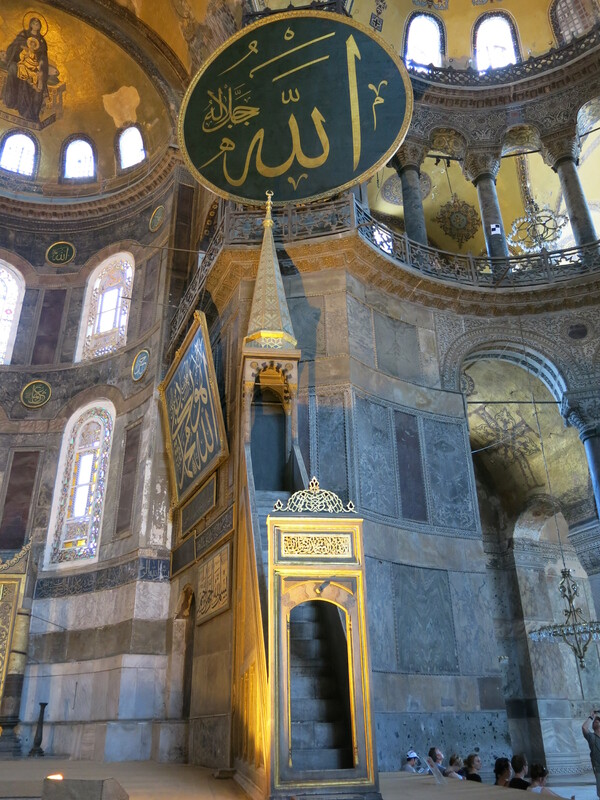 Sinan also borrowed some architectural features from the Byzantine era Aya Sofia by designing the central prayer area under an immense dome. Emre said that from then on, all Turkish mosques contained a dome, and indeed, as we traveled around Turkey, I never saw a mosque without one. 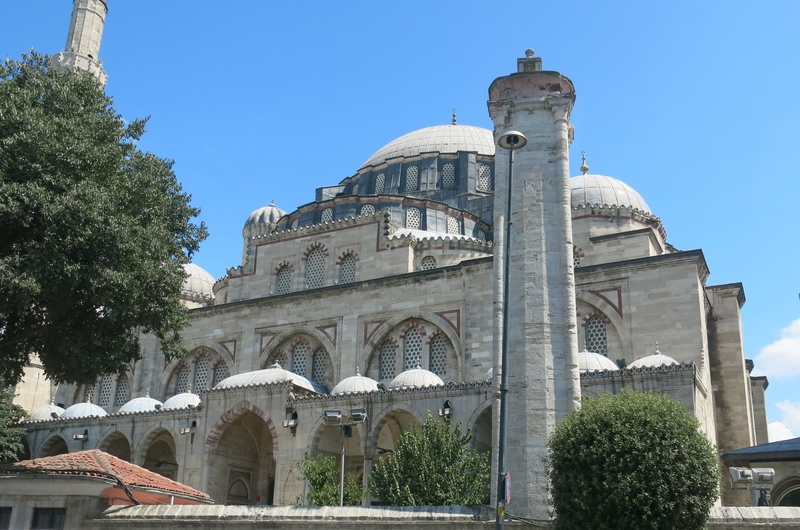 At the time this mosque was constructed, it had the highest dome of any mosque in the Ottoman Empire. Side view of Suleiman’s Mosque with two of the four minarets. 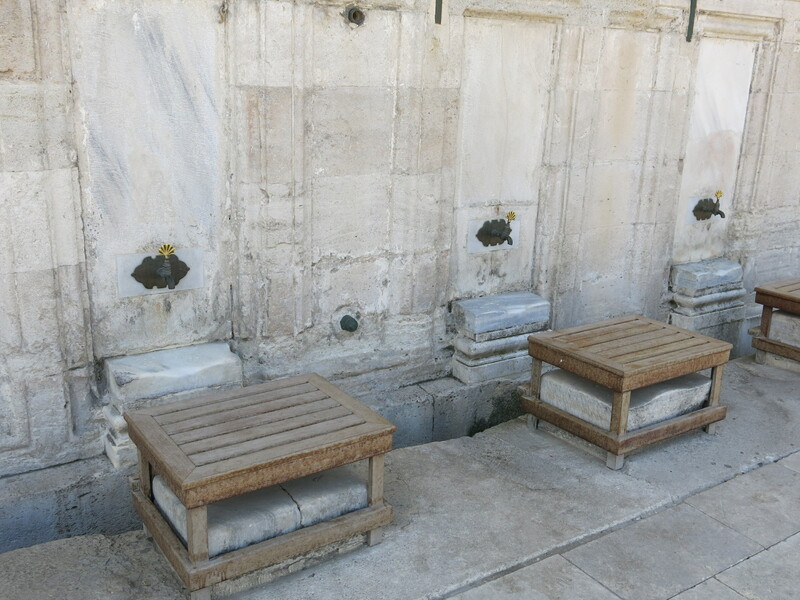 Where men perform their ritual ablutions before entering the mosque. Any similar facility for women is enclosed so that their ablutions are shielded, per custom. Gravestones of a husband and wife. 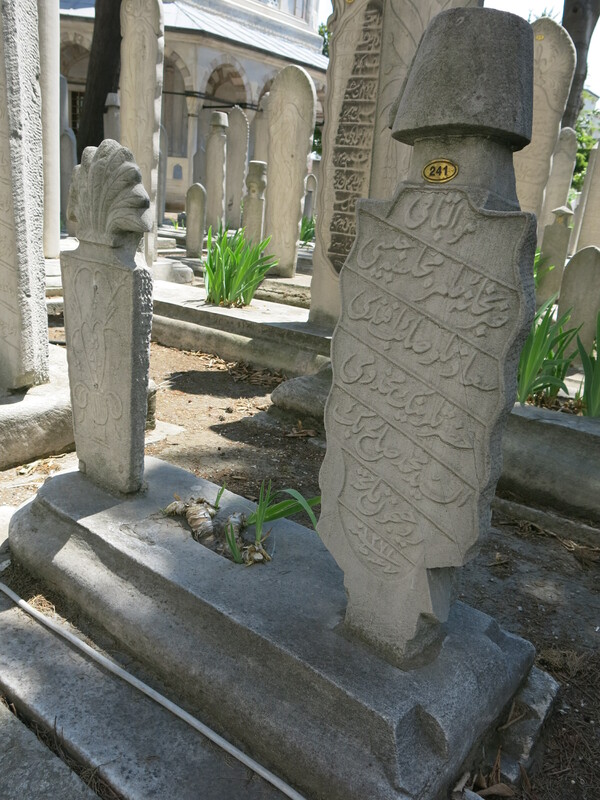 The husband’s stone is topped by a fez, indicating a man is buried below. 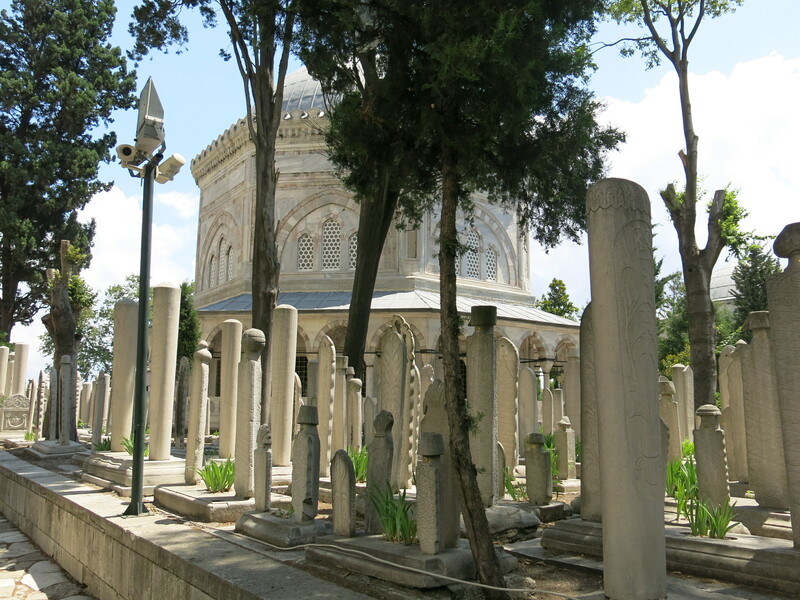 Suleiman’s tomb amidst hundreds of grave stones. As in most major mosques, the place of worship is one of several facilities in a multi-building complex. 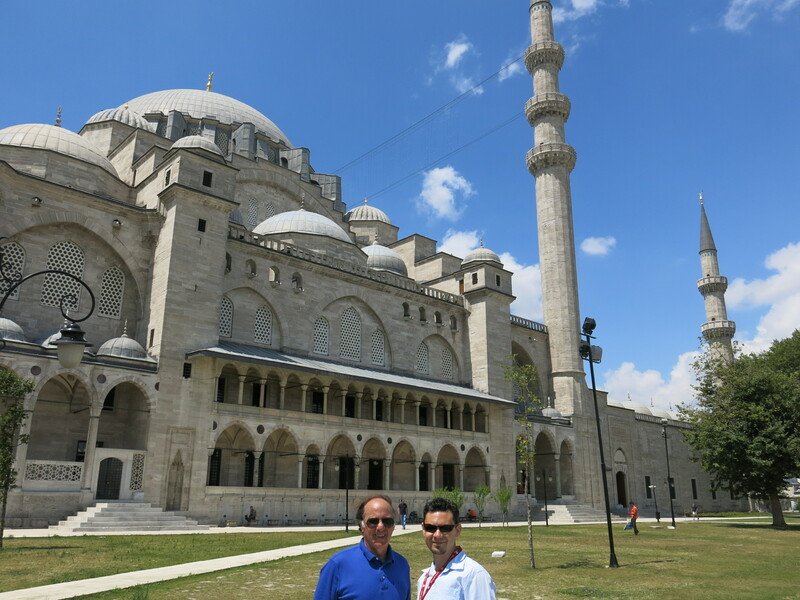 In addition to the mosque, Sinan designed a huge complex containing a large courtyard and columned portico, four schools, a hospital and medical school, public baths and kitchens, and the royal tombs of Suleiman and his chief wife. 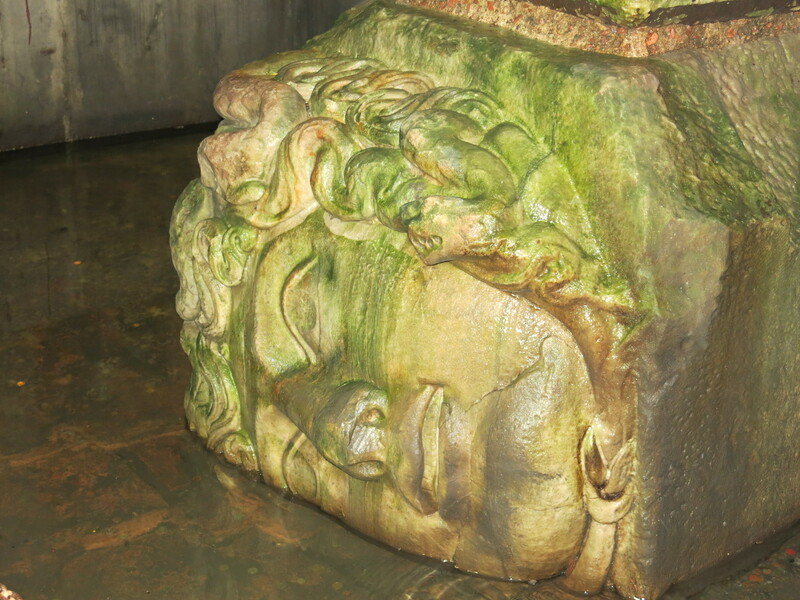 The Basilica Cistern is reminiscent of a watery cathedral. Huge carp swim in the waters. 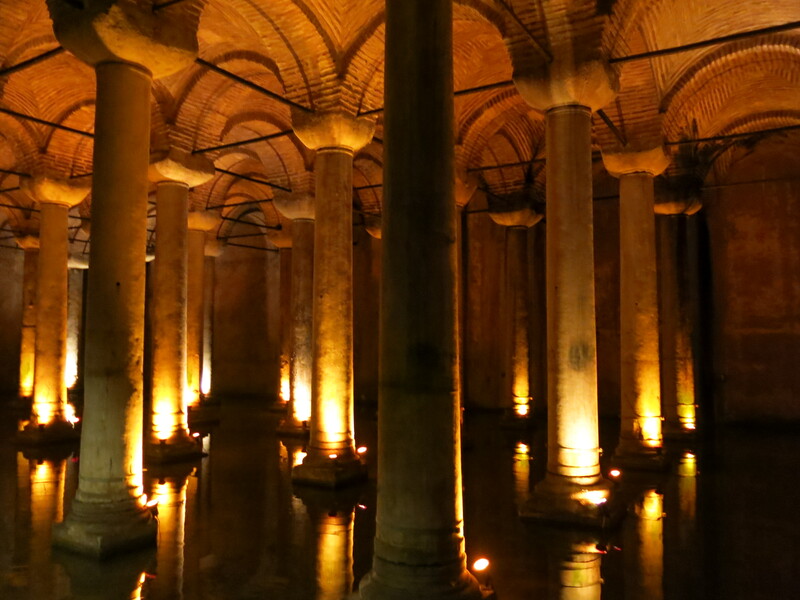 Built by the Emperor Justinian in the 6th c., the immense underground cistern is as big as a cathedral, and the largest of several cisterns in the city. All are part of an aqueduct and water storage system built to provide and store water within the city’s wall for the population. The 336 columns used to support the 26-foot high roof are of various styles, and are believed to have been scavenged from older Roman and Greek sites during the construction of the cistern. 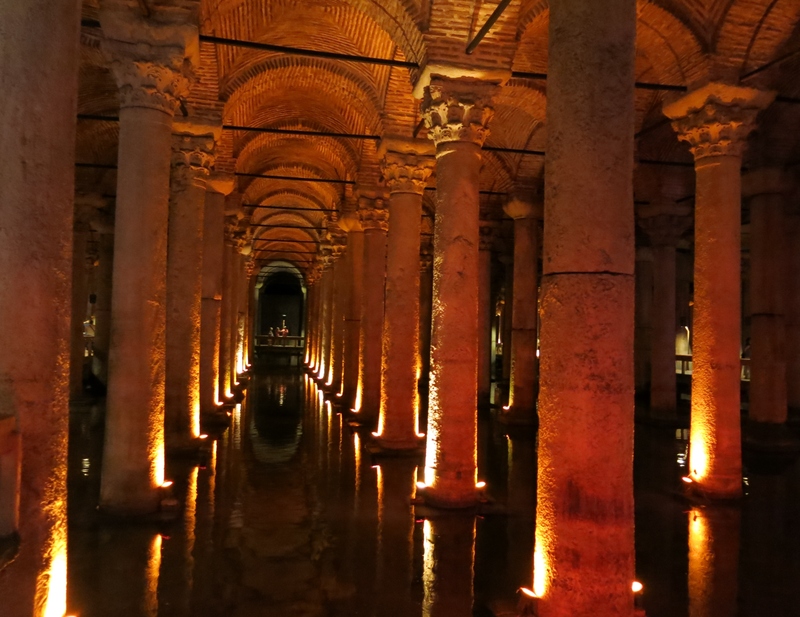 This particular one is called the “basilica” cistern as in later years a Christian basilica was built over the underground facility, and forgotten about for centuries until its rediscovery in the mid-19th century. 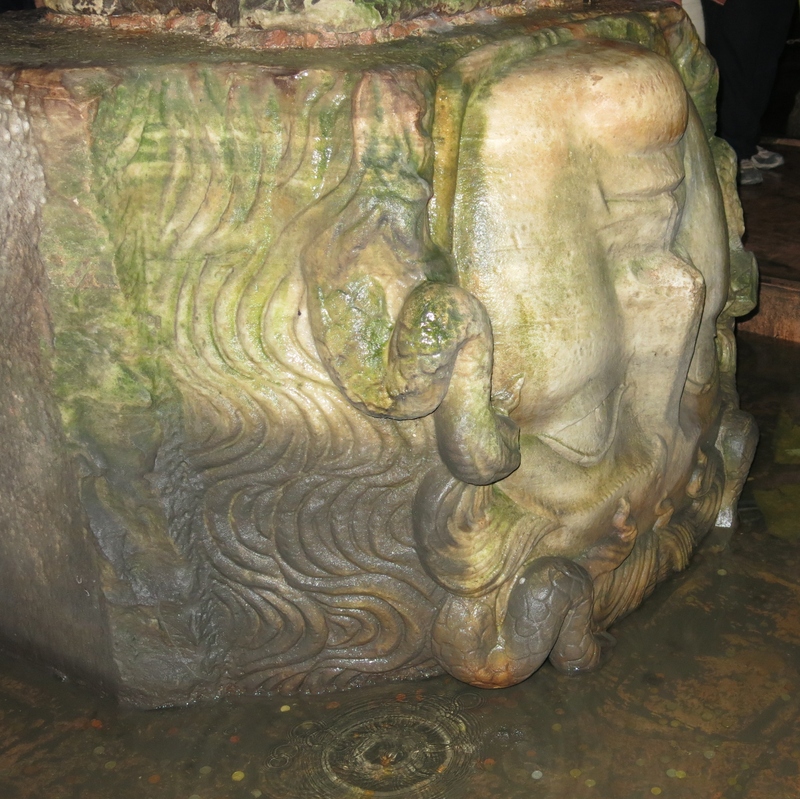 The second Medusa, upside down. Teardrop motif — or is it the evil eye? The Aya Sofia, with the Blue Mosque to the left. Below the hill are remains of the Byzantine city walls dating from the 4th to 6th c.
One of the most defining icons of Istanbul, the Aya Sofia dominates the skyline of the old quarter, especially as seen from the waters of the Golden Horn or the mouth of the Bosphorus. 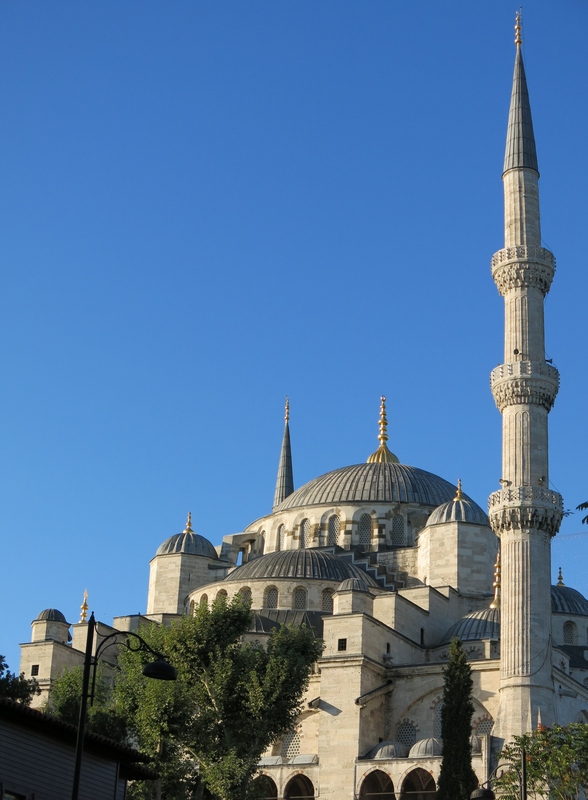 Along with the Blue Mosque and Topkapi Palace, it is one of the three most visited sites in Istanbul. 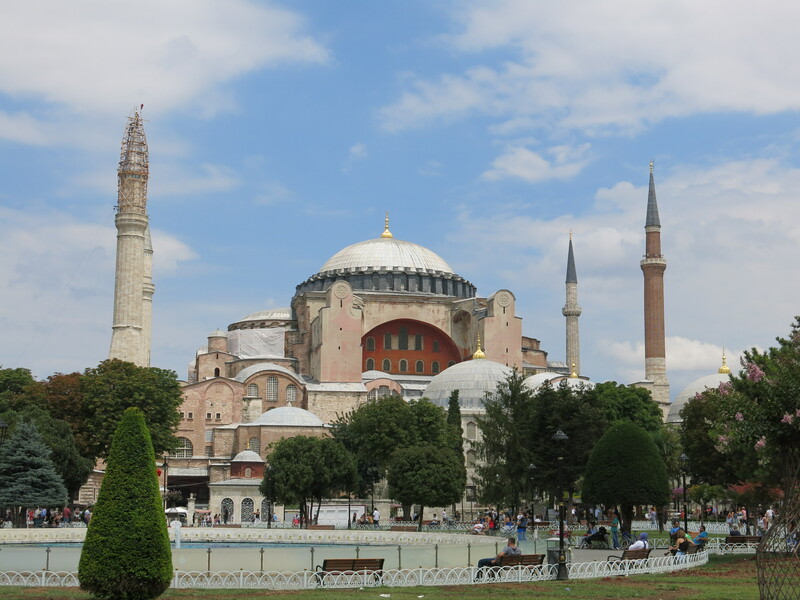 Its original name, in Greek, Hagia Sophia, literally means Church of the Holy Wisdom. Completed in 537 A.D., it was the largest Christian church and monument for nearly a thousand years and is still considered the greatest example of Byzantine architecture in the world. 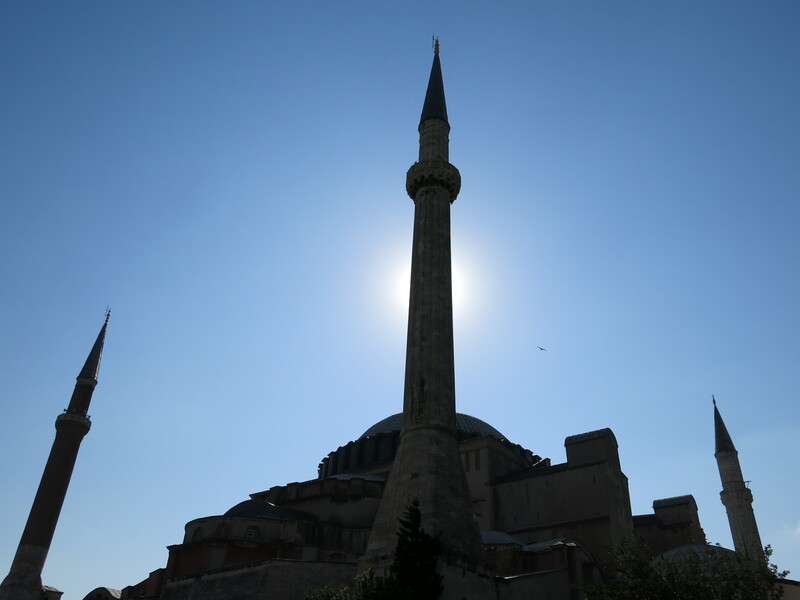 After the fall of Constantinople in 1453, the Ottomans converted it to a mosque; Ataturk, the great Turkish leader, turned the Aya Sofia into a museum in 1935 so that its beauty can be enjoyed by people of all faiths. To this day, restoration efforts are attempting to recover some of the plastered-over mosaics and frescoes from the early, Christian era, and while some have been successfully uncovered, others are lost forever. Not all of the damage to the church’s décor came from the Ottomans, however. In 1204 the Venetian-led Fourth Crusade decided to forego rescuing Jerusalem from the “infidels” and instead, sacked Eastern Orthodox Constantinople instead. 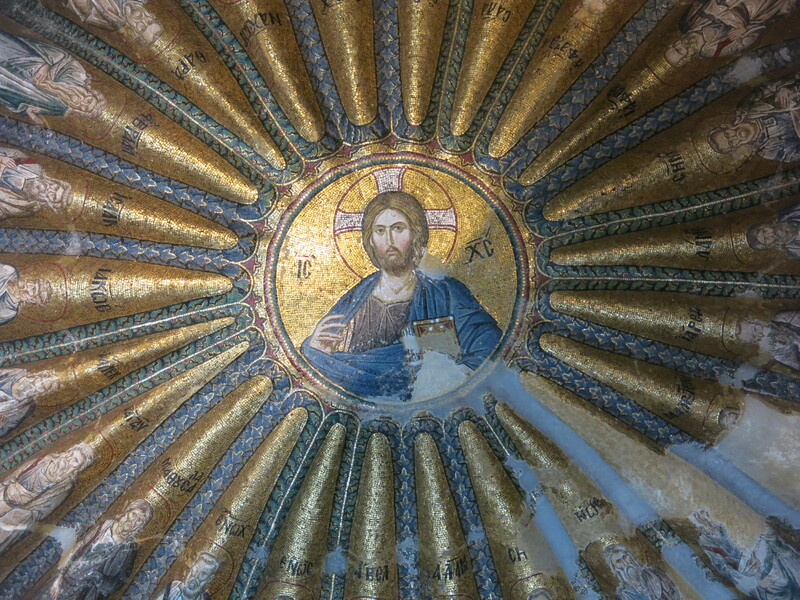 * Among the artwork and artifacts vandalized or stolen from in the city were many of the golden mosaics from Aya Sofia. 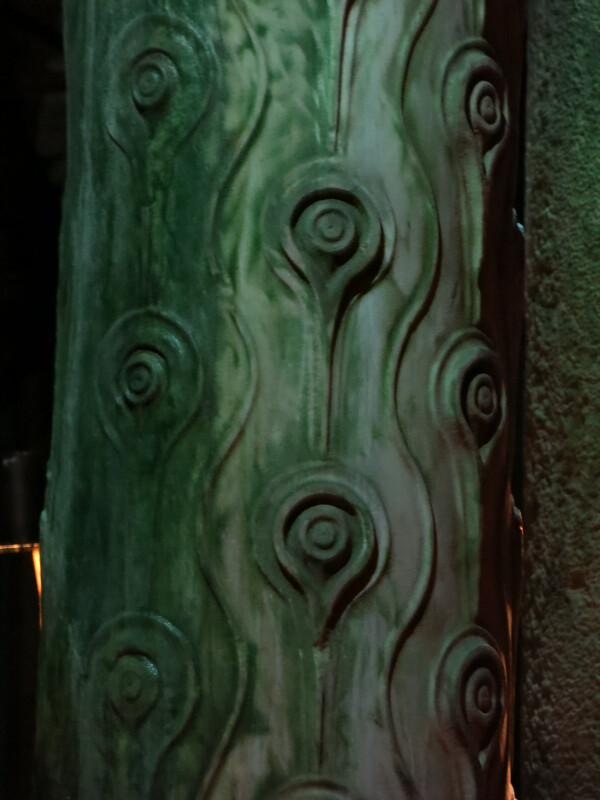 Thankfully, a few remain and have been restored. Unfortunately, because of the on-going reconstruction, we weren’t able to see all the interior or go to the upstairs galleries which contain some of the more beautiful mosaics. 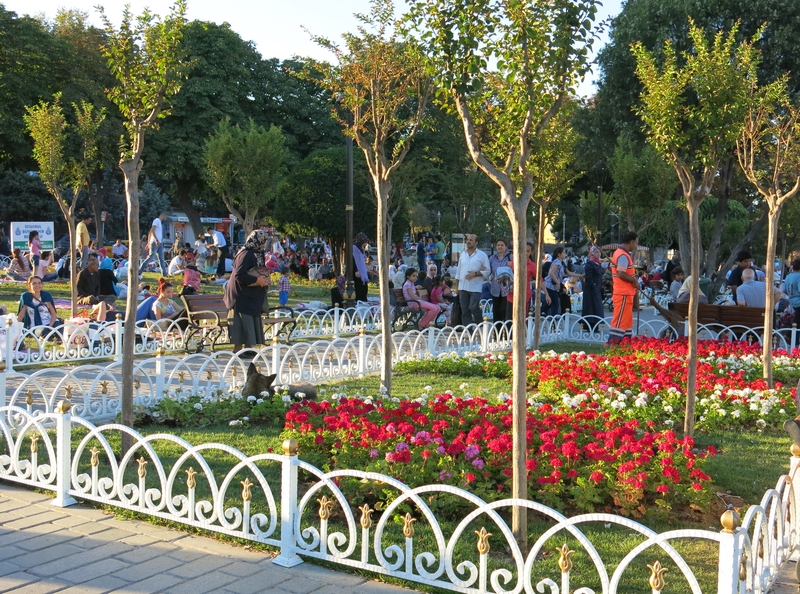 Aya Sofia has a lovely park in front of it. One of the recovered seraphs, Archangel Gabriel. The central dome of the church, supported ingeniously by two half-domes and four pendetives, is truly a masterpiece. Originally, the dome was over 182 feet high and more than 100 feet across. Subsequent restorations due to damage from earthquakes and warfare have reduced the size and shape of the dome somewhat. 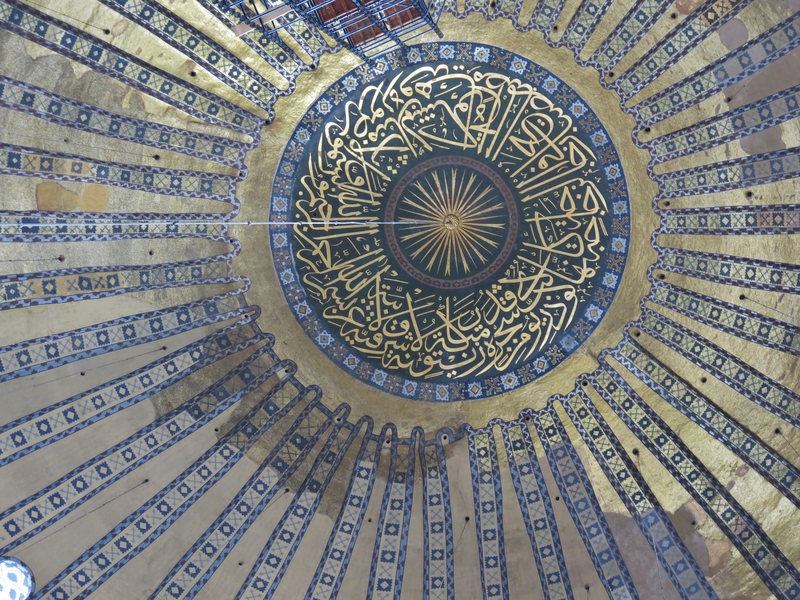 Islamic scriptures and decorations added over the plastered Christian images in the dome. The minbar, or raised platform, much like a pulpit, from which sermons or speeches are given. 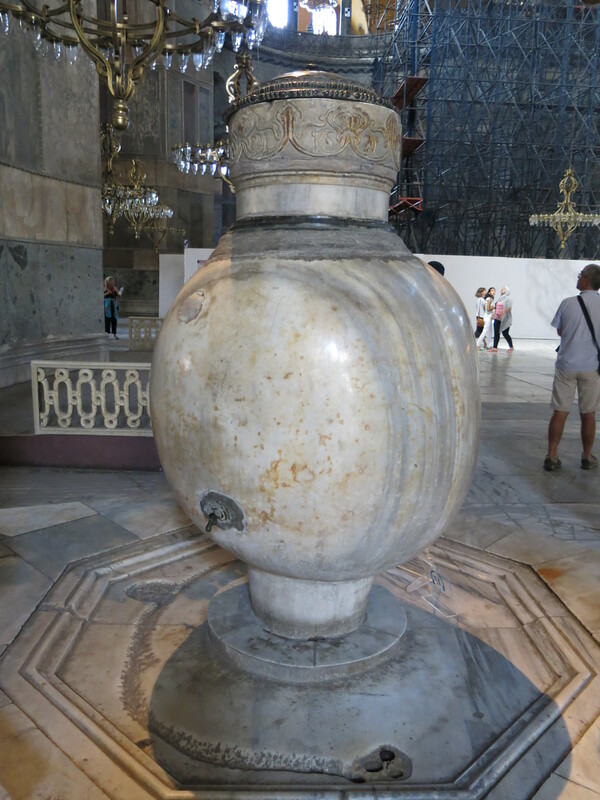 One of two giant marble urns, used for ritual purification, brought from Pergamom by Sultan Murad III. Each is carved from a single block of marble. In keeping with the church-mosque’s current role as a museum, curators have kept many of the Islamic decorations that were added on top of the plastered-over Christian frescoes and mosaics. Among these are four huge medallions of gold Arabic script on black with the names of Mohammed, the Prophet, and the first three caliphs. 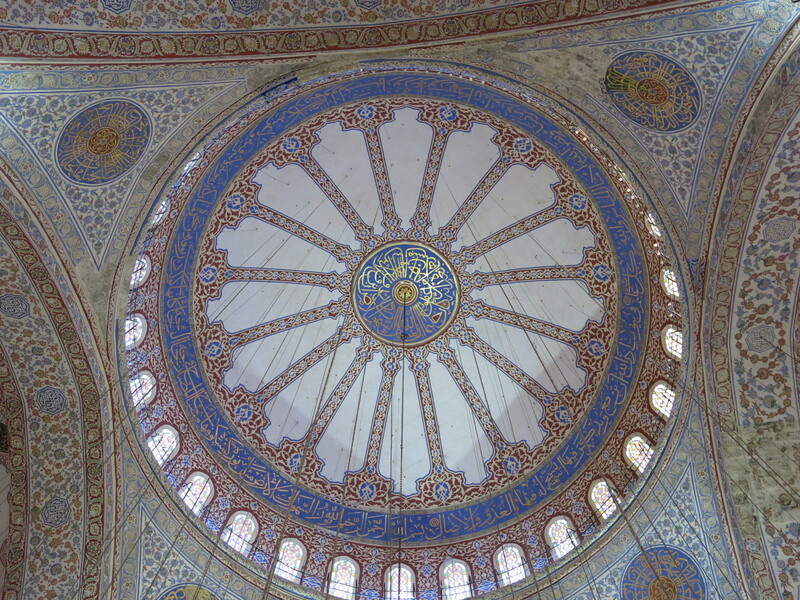 One of the smaller domes is also a beautiful example of Islamic calligraphic art and has been preserved as well. Standing opposite Aya Sofia is the imposing Blue Mosque, the mosque designed and built for Sultan Ahmet I by Mehmet Aga, a student of the great architect, Sinan. 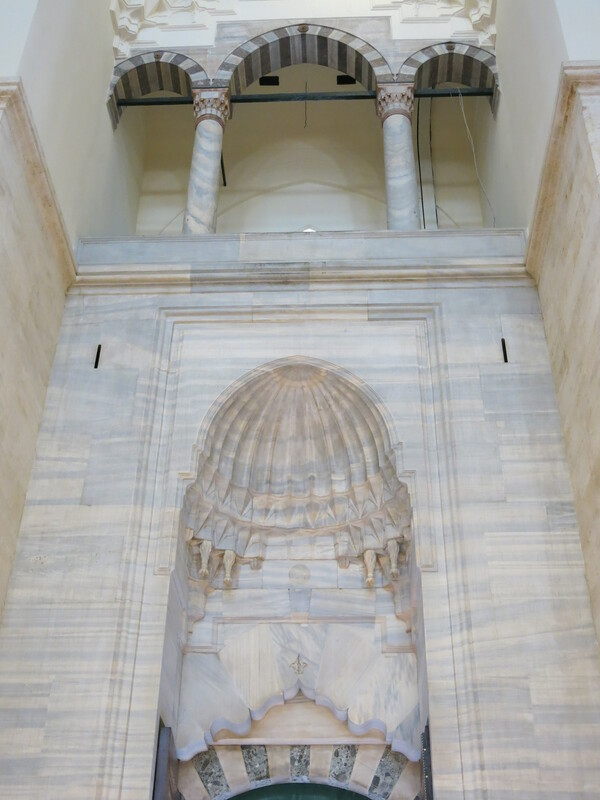 Mehmet Aga, many believe, took inspiration from Sinan’s works as well as Aya Sofia and created a mosque which surpasses any other in its beauty, airiness, light, and form. And, in fact, this is one of the most beautiful mosques I’ve seen. But it is the interior décor that truly lets this mosque shine above others. Much of the interior is covered in blue-green Iznik tiles, and the hundreds of windows illuminate the interior and tiles brilliantly. 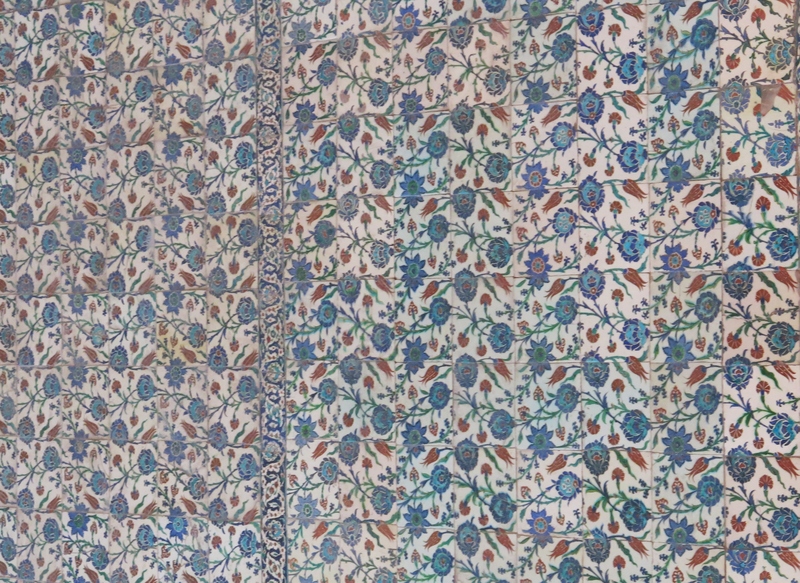 Interior of Blue Mosque displaying tiles. 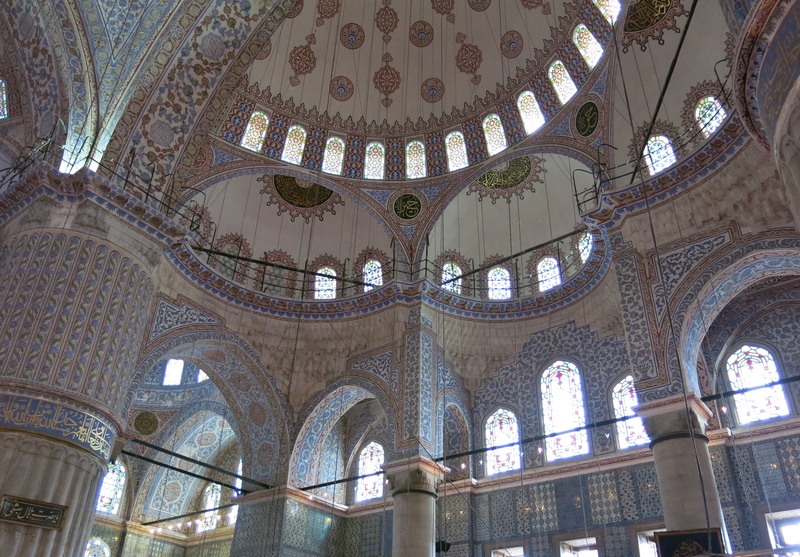 The Blue Mosque has 20,000 blue tiles on its interior walls, hence the tourist-given name. As this is an active mosque, not a museum, and we were in the middle of Ramadan, there were many people – almost all men — coming into the mosque to pray, or performing their ablutions outside. But tourists were permitted during the “non-official” prayer times, along as we were quiet and respectful. Following the required “etiquette” for entering mosques, we left our shoes in the designated repository, and I rolled down the cuffs of my pants to cover my ankles and covered my hair with a scarf. Only practicing Muslims were allowed within the inner prayer area, which was separated only by a low bannister, so we walked around inside, talking quietly with Emre, who told us a few facts about the mosque. As large as it is, the mosque was completed in just eight years, a remarkable feat. (I wanted to ask how many slaves had died to make this construction deadline, but felt that probably wasn’t a welcome question.) Another interesting feature is the six minarets attached to the mosque. 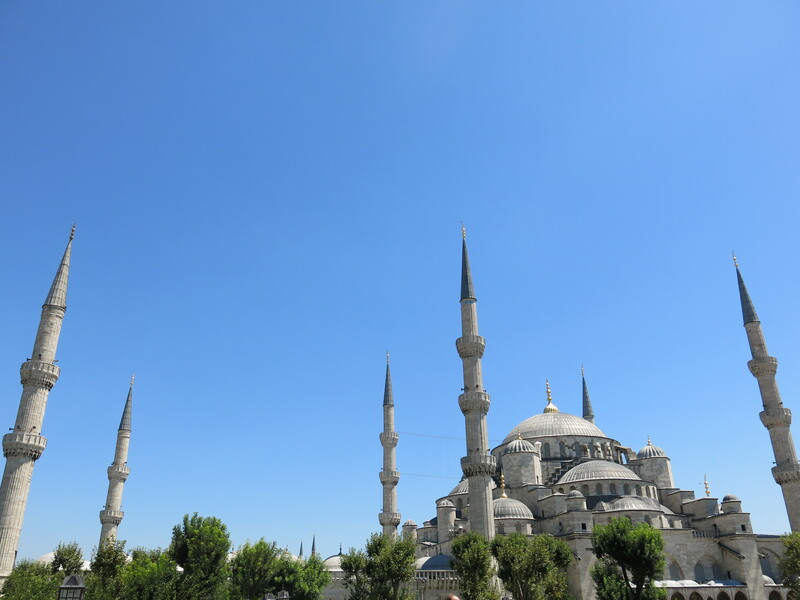 Aga, the architect, apparently got carried away and went beyond the standard 4 minarets for a Sultan’s royal mosque. Unfortunately, the maximum number of minarets a mosque can have was a tradition set by the six minarets of the Majid al-Haram mosque in Mecca: no other mosque in the world was allowed to have an equal number of minarets. The mosque was so beautiful, so peaceful, but unfortunately for us, the afternoon sun was dipping low, and we had to hustle out of the mosque, which is closed to visitors during the five official prayer times. 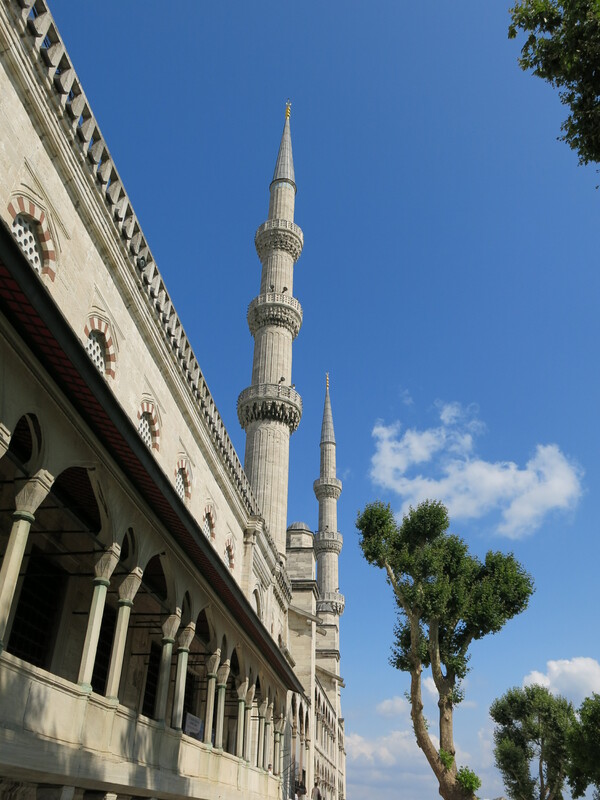 Even as we left, the muezzins’ calls to prayer were booming from loudspeakers on the mosque’s minarets, calling the Faithful to the evening prayer, echoed by the musical calls to prayer ringing from minarets across the city. As we left Emre after nearly ten incredible hours of Istanbul history and architecture, we saw hundreds of people streaming into the Hippodrome plaza, on one side of the Blue Mosque, where picnic tables were set up for people coming to join family and friends for the breaking of the daily Ramadan fast after sundown. Many families came together, carrying bundles of food to share with friends, while others gravitated toward the portable grills and food carts brought by entrepreneurs with foodstuff to sell. The sweet smell of roasting corn, kebabs and chops grilling drifted on the air as people drifted onto the grass and benches in the parks between the Blue Mosque and the Aya Sofia, those two sentinels of Istanbul, chatting quietly, waiting, until the sun went down, to break the day’s fast. People gathered in the Hippodrome plaza, waiting for sundown and the call to break that day’s fast. *A fascinating book by Roger Crowley on the genesis of this “crusade” is City of Fortune: How Venice Ruled the Seas. He has also written two other books on the struggle between the Ottomans and the loose coalition of Christian European nations for control of the Mediterranean. 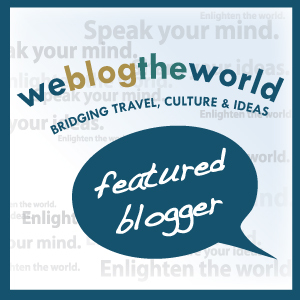 Those of you who’ve loyally followed my travel blogs for the last two years have probably wondered why I haven’t talked about cheese – especially Dutch cheese – in over a year. 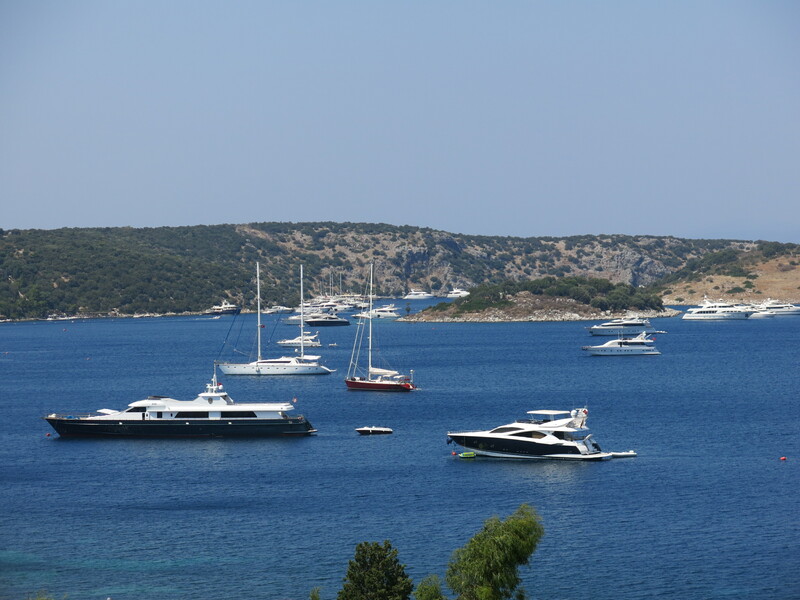 (And for those handful who roll your eyes over my “cheesy” posts, well, you can stop reading right here and skip to the pictures & pirates section of the Bodrum peninsula down below.) I would never categorize myself as a cheese “fanatic,” or worse, a “foodie” (although I did participate in a partial “foodie” tour in Odessa), but I do love trying new foods. And travel provides ample opportunity to sample local goodies. Most of the hotels we stayed at in both Greece and Turkey included breakfast as part of the rate, thus providing a nice way to sample local and traditional breakfasts, which rely on cheese in both countries. Predictably, the cheese and vegetable platters were the first stop I made. The above picture depicts one of my favorite combinations for breakfast – a little unorthodox for typical Western tastes, but oh, so very tasty. 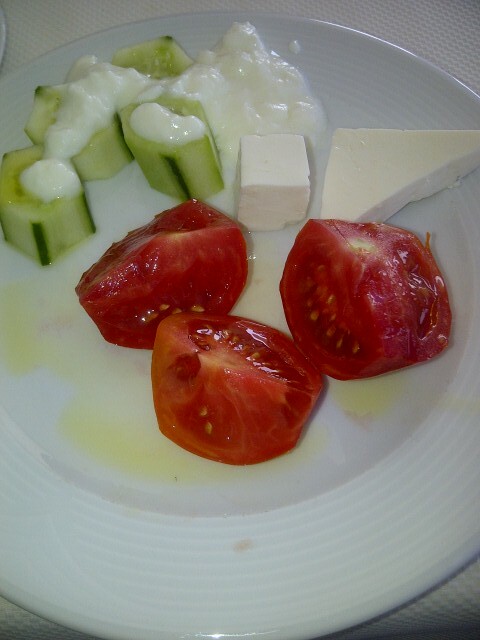 In our first stop in Turkey, Bodrum, I fell in love with a popular Turkish cheese called tulum. It was similar in taste and consistency to a Greek cheese I learned about in Athens, manouri. Both are of a creamier, smoother consistency than feta, and less salty, with a mildly sweet (but not sugary) taste, and, both are based on goat milk, but with an infusion of cream. And just as an aside, the feta we consumed throughout Greece was totally different and far tastier than what we get here in the States, which is, among other things, saltier, drier and more crumbly than in native Greece. most sources named Greece as the leader, by far, with estimates on per capita consumption ranged from about 55 to a whopping 71 pounds per person. I think the latter included both personal purchases as well as consumption through restaurants. Interestingly, the U.S. was usually in the top 10 for cheese consumption. Cheese-making began in the Mesopotamia region, which encompasses parts of modern day both Turkey and Iraq. The largest region producing cheese is – no surprise – the European Union. The largest producing country is the U.S. Despite all those cheesy ads from the California Dairy Association, Wisconsin is STILL the leading cheese producer in the U.S.
Back to Turkey….Cheese is consumed throughout the day. It’s a staple at breakfast, and it’s offered in many forms and varieties as mezes (small appetizers, somewhat like Spanish tapas), and both side and main dishes. 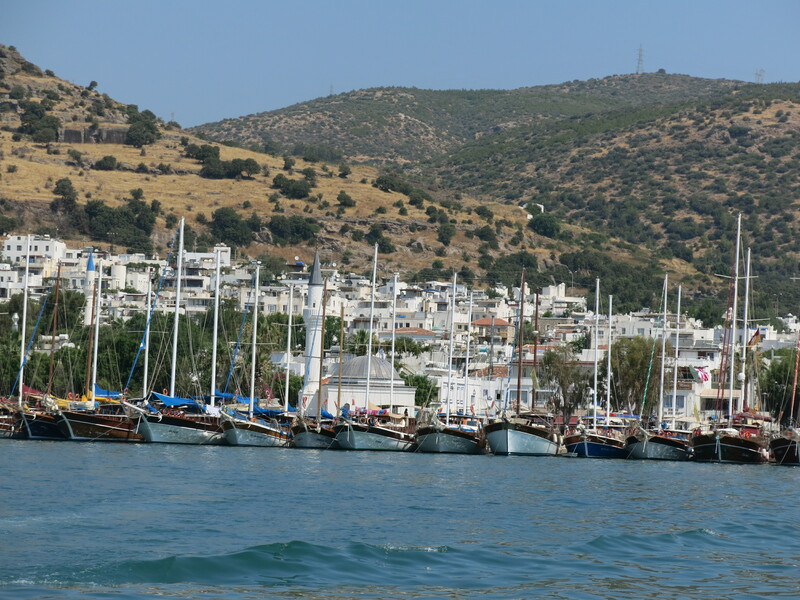 Now onto Bodrum, pirates and nutcase drivers…..
We took a fast catamaran ferry from Rhodes to Bodrum. The ferry itself was comfortable; the ride was not, but no one got sea sick that I saw despite the crosswinds and rough seas. 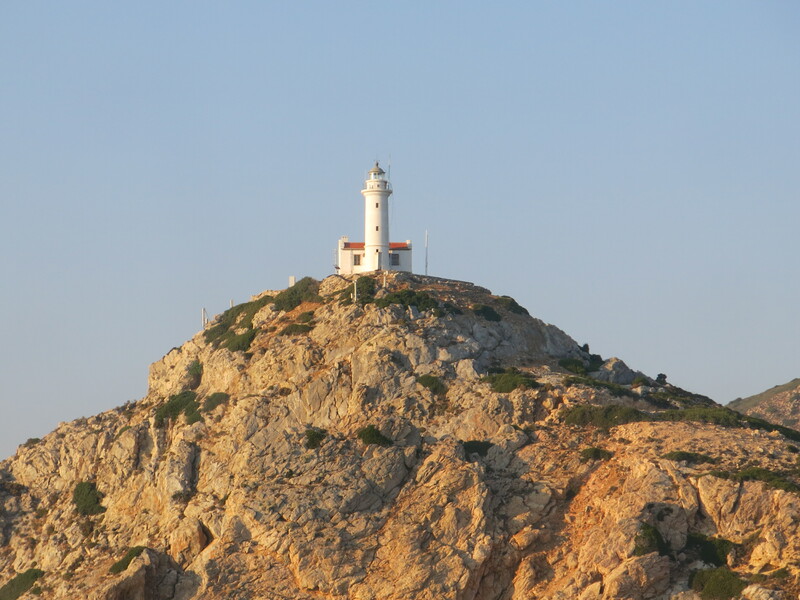 The best part of the trip was seeing this beautiful lighthouse as the sun was winding down. I never learned the name of the lighthouse or the small, (seemingly) deserted island it was on, but if anyone out there does know, let me know! 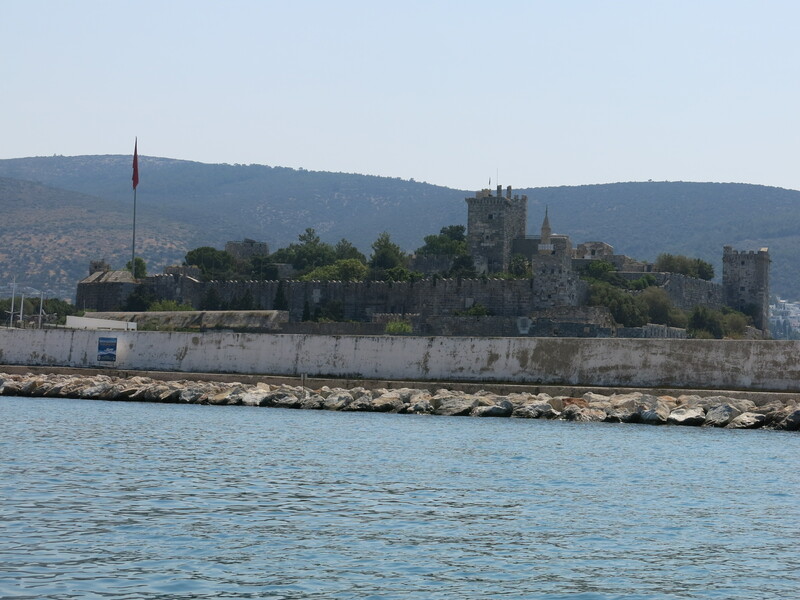 Bodrum Castle, also known as the Castle of St. Peter, built in 15c. by the Knights of St. John. 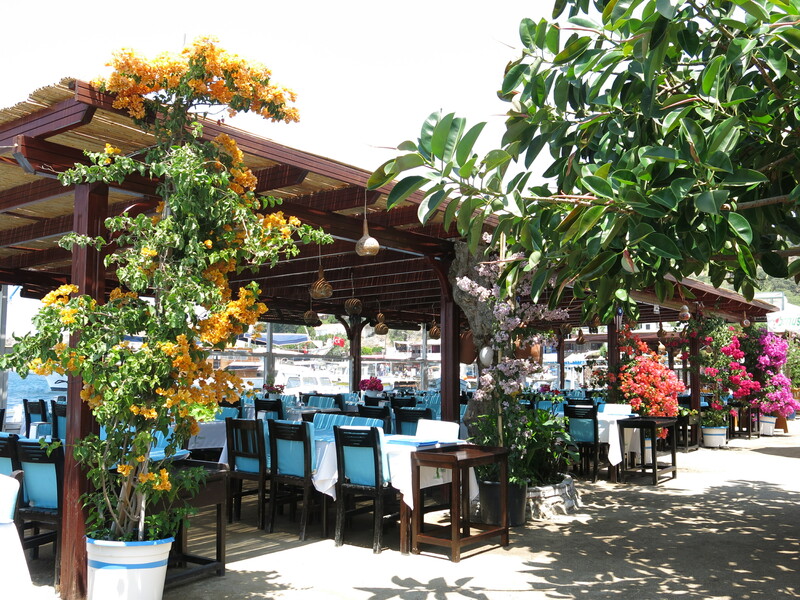 Bodrum Marina. Notice how arid the landscape is. Bronze statue of deep sea diver in Bodrum Marina. There was no English translation provided on the plaque, but my guess the statue commemorates the divers and sponge diving industry for which Bodrum was once famous. 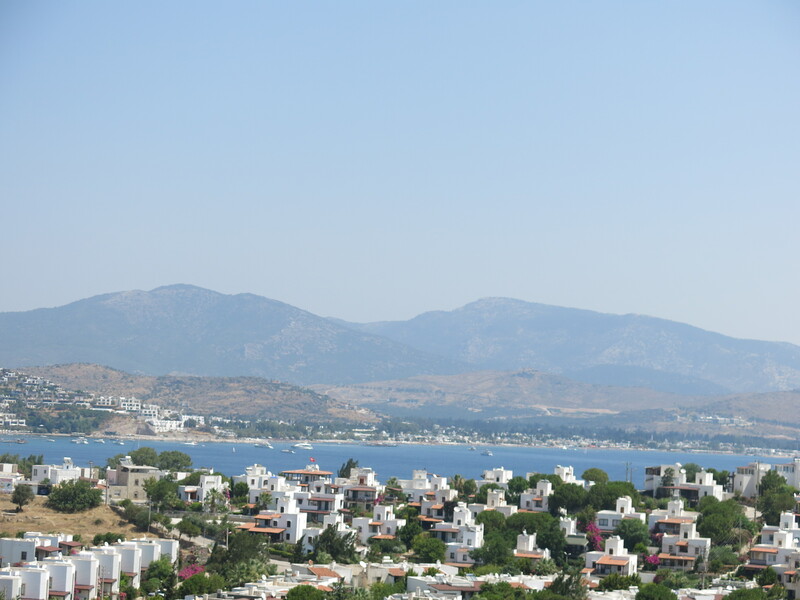 Bodrum city, itself isn’t all that attractive; it’s overrun with tourists, and traffic is a nightmare in the narrow, one-way streets. (Well, at least “one-way” for most drivers.) Besides a few ruins, there aren’t that many truly interesting sights beyond the castle and the museum. (Or, at least, we were just burned out!) 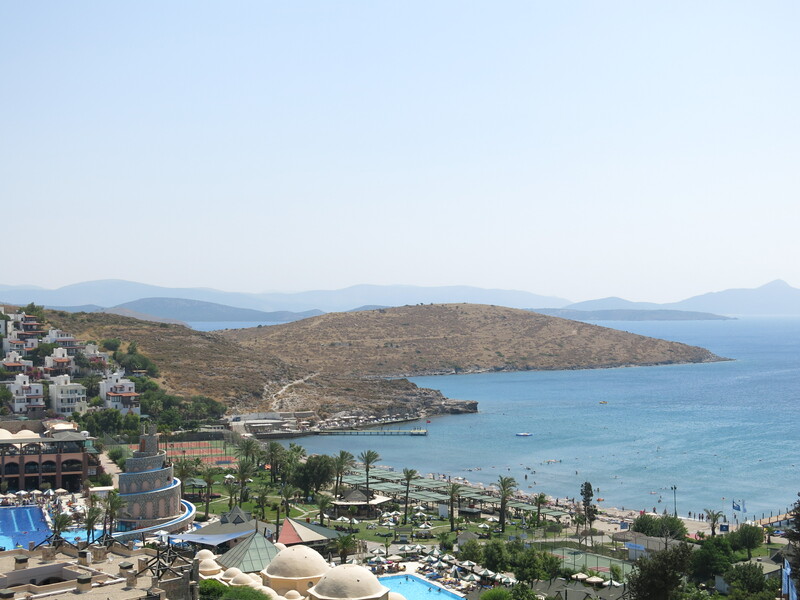 Despite our recent “misadventure” in Rhodes, we decided to rent a car and drive around the Bodrum Peninsula. Our rental vehicle was delivered to us with the gas needle in the red, way beyond simply “Empty,” so finding a gas station shot to the top of our priorities for the day. And, of course, we promptly got lost in the labyrinth of one-way streets. Once again, I will spare you the car “conversation” because this blog is supposed to be “PG-rated” per the host site rules. (Those of you who continue to think Michael is the gentlest, most tolerant person on earth may want to reconsider your assessment.) But once we had gassed up, we headed west for our circumnavigation of the peninsula. 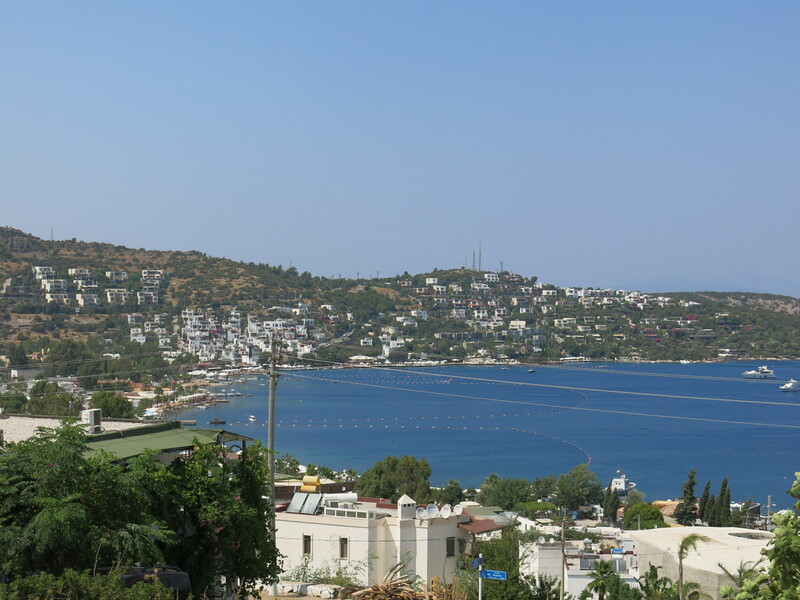 Both Bodrum, the town, and the peninsula have been, for centuries, sleepy little fishing villages with sparse agriculture due to the extremely arid clime. In the mid-20th c., “outsiders” discovered the beauty and turquoise waters and quickly became a tourist and sailing destination. At one time, however, the town of Bodrum was strategically important to European Christian nations – and to the Knights of St. John, in particular, those fearless “Defenders of the Faith.” The Bodrum Castle, built by them in 1437, was along with Rhodes, the Knights’ – and Christianity’s – last eastern holdouts against “the Infidels” after getting shoved out of the Holy Lands in the late 13th c.. When Rhodes fell to the Ottomans in 1522, the Knights wisely perceived the danger of being squeezed from both sides, surrendered their fort to the Ottomans, and hightailed it to Malta. But the Carians, Greeks and Romans had been all left remnants of their occupations on the peninsula over the centuries, and some interesting ruins and presences remain. Herodotus, the “Father of Historians,” was born here; King Mausolus ruled, died and was buried here, and most famously gave his name to any tomb of grandiose structure. Another native son was Turgut, the notorious corsair – opponents claimed “pirate” — who later became the chief Admiral of the Ottoman Fleet under Suleiman the Magnificent. 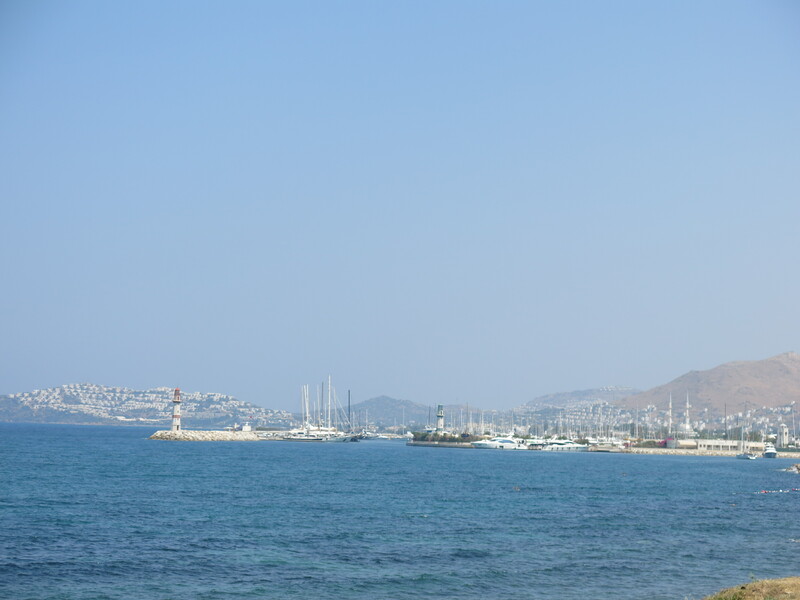 The town of his birth, west of Bodrum, was renamed “Turgutreis” in his honor, and this was one of our destinations for our road trip. Turgut – whatever his foes thought of him in his own time – was a brilliant seaman and military tactician. He and his “mentor”, Barbarossa (the pirate, not German monarch), both wreaked havoc on the Christian outposts in the Eastern Mediterranean for decades. Suleiman the Magnificent, one of the longest-reigning Ottoman sultans, had the foresight to elevate first Barbarossa, then Turgut, to Admiral of the Royal fleet. In their wake, both men changed history for all time. By steadily beating back Christian crusader outposts or self-appointed “defenders,” such as the Knights of St. John, the Ottomans came to conquer and control the eastern Mediterranean for centuries after both died. Most historians cite Suleiman as the great Ottoman conqueror, but in reality, it was his great admirals and armies that pushed back the borders of Europe, thus changing the face of southeastern Europe, with ramifications to this day. And back in the modern-day…We quickly found out that Fodor’s had been correct about a few things, perhaps. 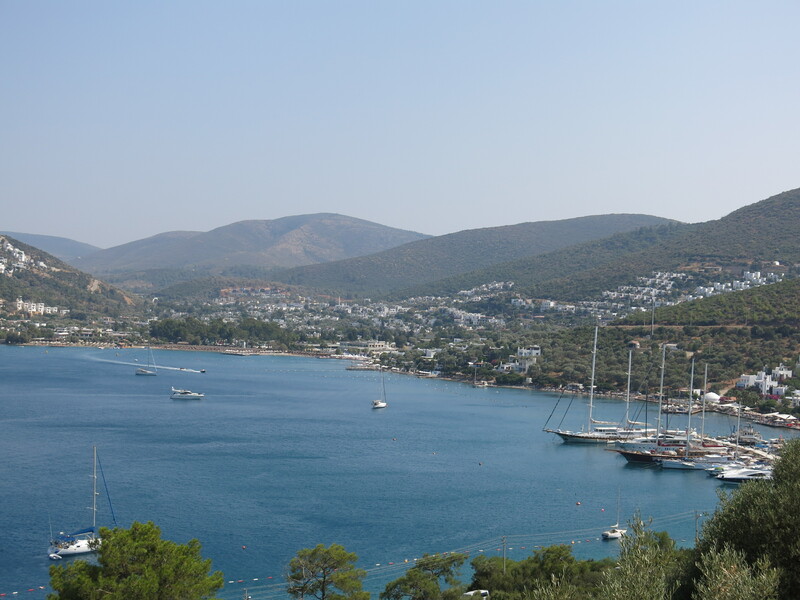 When Bodrum and its peninsula were “discovered” mid-20th century, modern tourism hit the peninsula with a vengeance. Many sleepy little fishing villages now look like a Turkish version of Monaco, with thousands of holiday villas and hotels sandwiched into the terraced hills looming over the turquoise bays. In fact, Golturkbuku is nicknamed the “St. 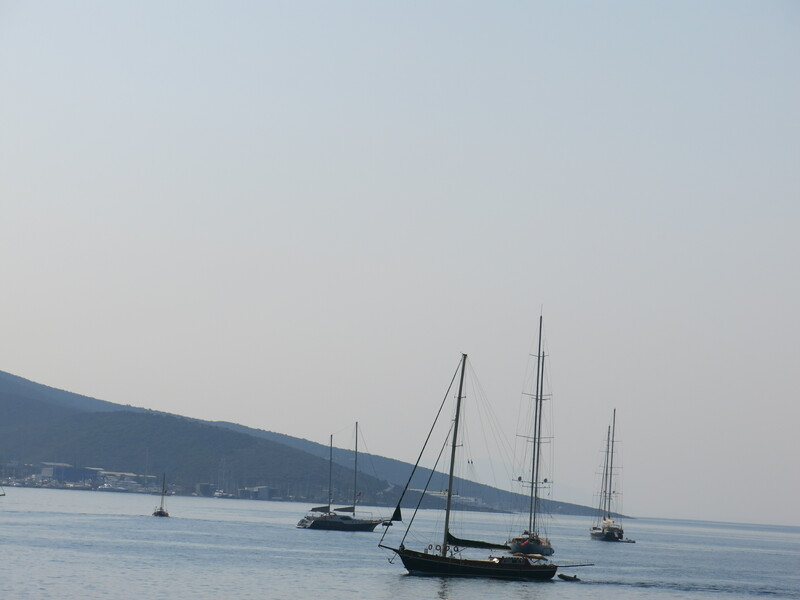 Tropez of Turkey,” thanks to the waves of wealthy Turks and Europeans flocking there in summer. In between these pockets of incredibly tacky tourist “hot spots,” the countryside is incredibly arid, sparse in agriculture and people. I spotted some olive and fruit groves, mostly figs, and, indeed, we bought some figs at a roadside stand that were the ripest, juiciest figs I’ve ever tasted. But for the most part, so much of the countryside was such a lifeless brown, there wasn’t much point in photographing it. 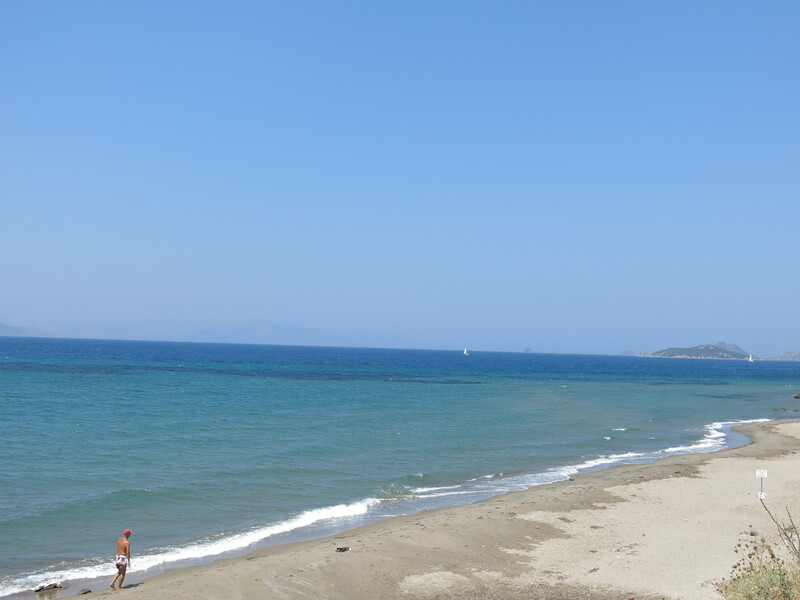 Miraculously, there were a few naturally sandy – and deserted – beaches along the way. In most areas, however, the steep, rocky hills sloped right down into a rocky shore. Along many stretches of the mostly 2-lane highway – which was in excellent condition – the only vehicles we’d see were the ubiquitous Dolmus mini-buses, which run people all over the peninsula. There are “real” inter-city buses, with a set schedule; these are a cheaper if somewhat irregular alternative. The driver has a sign posted saying where he’s going, and takes off when the mini-bus is full or almost full. 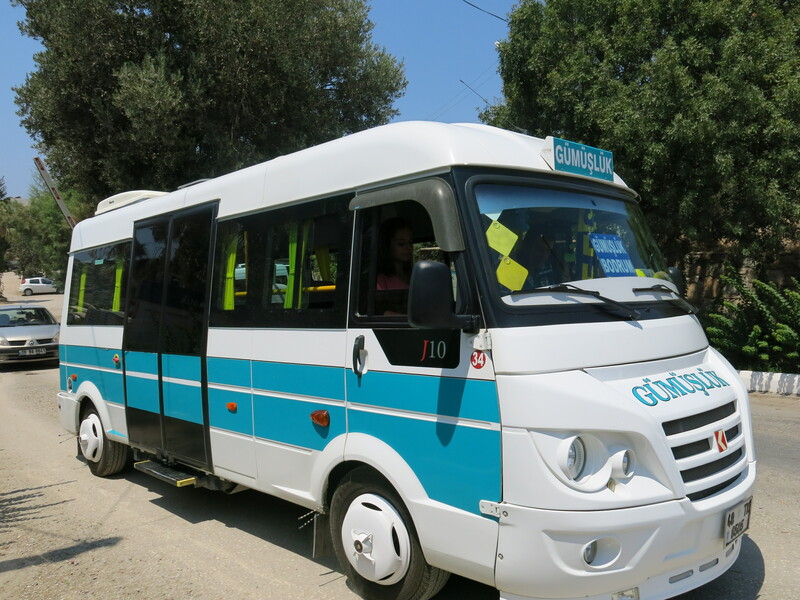 Unlike the bigger buses on set schedules and stops, the dolmus drivers will usually make unscheduled stops to let people off (or on) along the way. We did find two lovely towns that were less commercialized than most. Gumsluk is a small town renown for its excellent seafood in the west coast of the peninsula. There are many restaurants to choose from, but you run a gauntlet of shills pulling you into see their shining displays of fish and seafood. We stopped to eat at the first place that actually left us alone for two minutes to look at the menu ourselves. 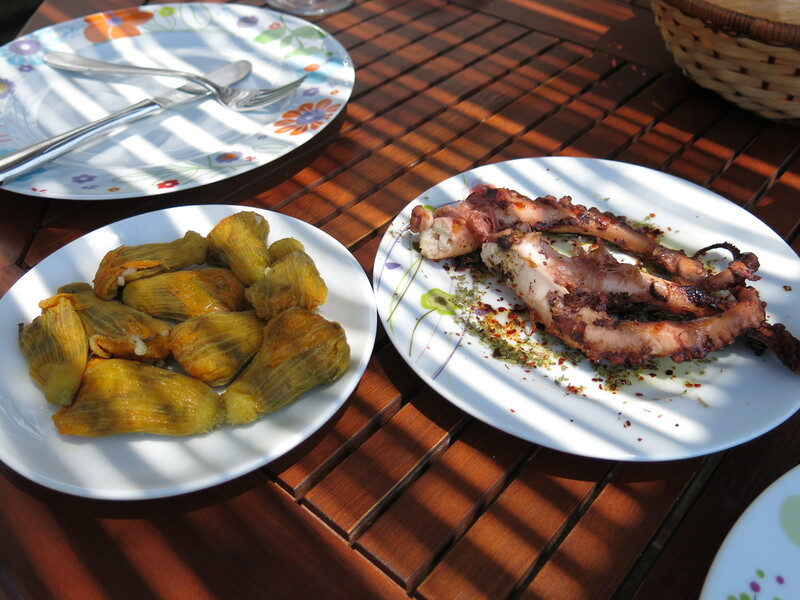 I had my favorite, grilled octopus, and went out on a limb for a version of sarma I’d not tried before. Sarma is the Turkish version of Greek dolmades, or stuffed grape leaves. Usually sarmas are also grape, cabbage or chard leaves stuffed with a rice and minced meat mixture; these were stuffed squash flowers, and while good, weren’t as good as the dolmades. 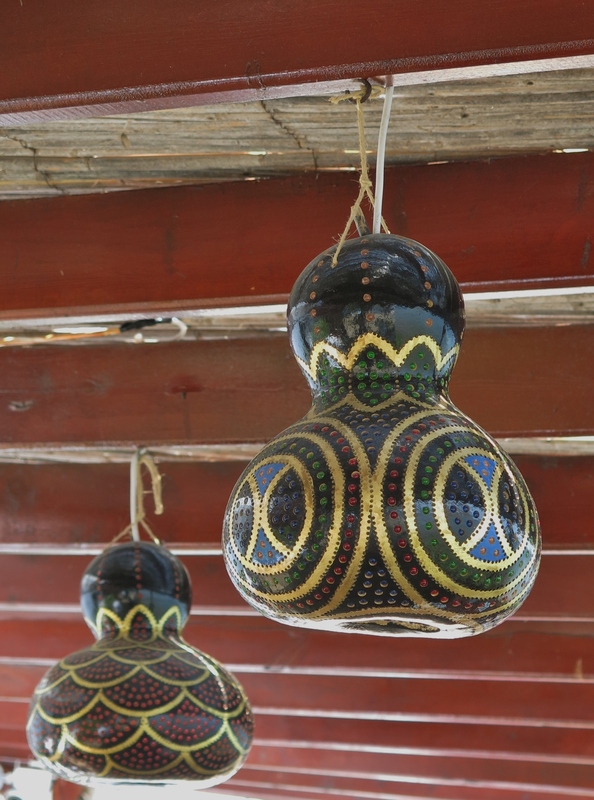 Gourds, dried, decorated and used as lampshades. The other pretty town was Torba, which along with Gumusluk, was much smaller and quieter than any of the other tourist destinations. 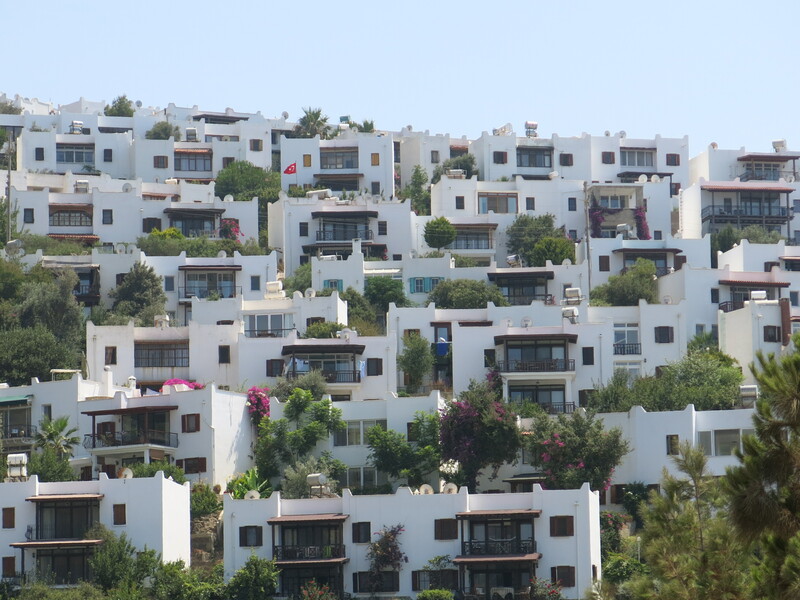 Yet Torba had its share of expensive yachts anchored outside the harbor, just not quite the same level of frenetic tourist activity as other towns on the peninsula: smaller hotels, more houses, no water parks, people weren’t sardined onto beaches. With Torba, we had pretty much followed our itinerary for the day. Not wanting to be on the hilly roads when the sun went down, we headed back towards Bodrum, our one-day road trip at an end. We made it safely back to the hotel without one incident. Despite the fairly universal acceptance of the road rule that traffic in a circle or round-about has the right of way, Turkish drivers blatantly ignore this rule and just drive into the circle regardless of how much traffic is already swirling through. We discovered this driving “peculiarity” early in the day the first time Michael got yelled and honked at for pausing at a circle to wait for an opening. That traffic circle accidents seem to be a common occurrence is reinforced by the fact that many circles actually have a “Stop” sign at the approach. We nearly got back-ended on our way back to Bodrum when Michael stopped at the “Stop” sign at a busy circle to wait for an opening in the stream of traffic. The small box truck behind him screeched on its breaks and blared its horn continuously as the driver wrenched the wheel and swerved the truck around us into the on-coming traffic. Just to punctuate their anger at our stupidity, the guy in the passenger side leaned his full torso out the window and screamed invectives at us along with some universal sign language with unmistakable intent. But we got back to the hotel safely. Which is all that counts. But I attribute it to the worry beads that were hanging off the mirror of the rental car.